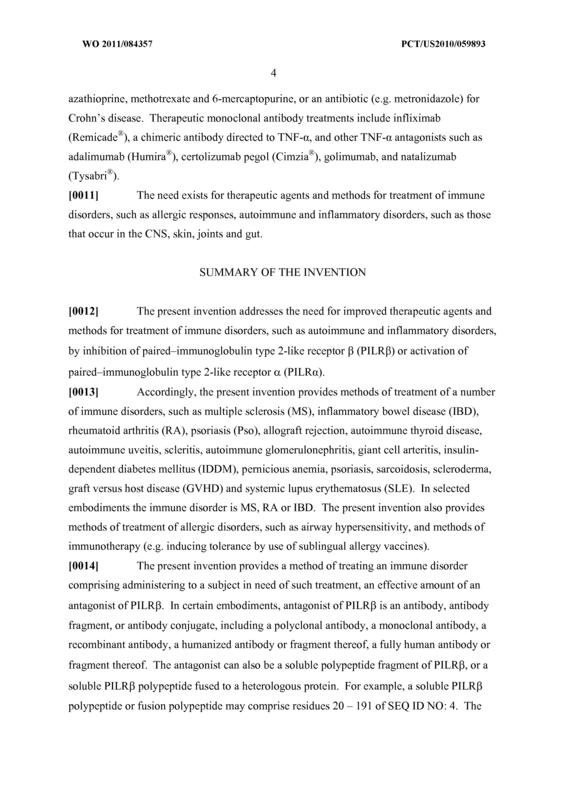 The present invention provides methods of using PILRa agonists, or PILRß antagonists, to treat immune disorders, such as autoimmune and inflammatory disorders, including CNS, joint and gut inflammation. 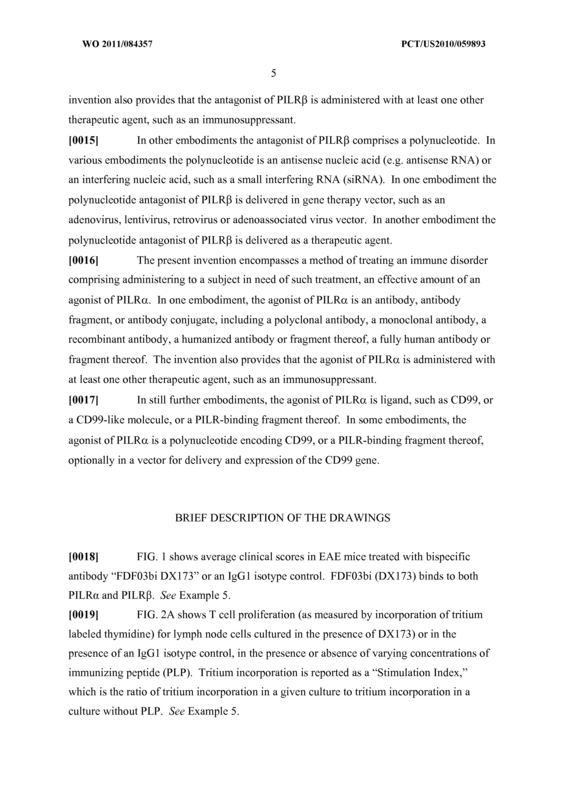 A method of treating an immune disorder comprising administering to a subject in need of such treatment an effective amount of an antagonist of PILR (SEQ ID NO: 4) or an agonist of PILRa (SEQ ID NO: 2) . 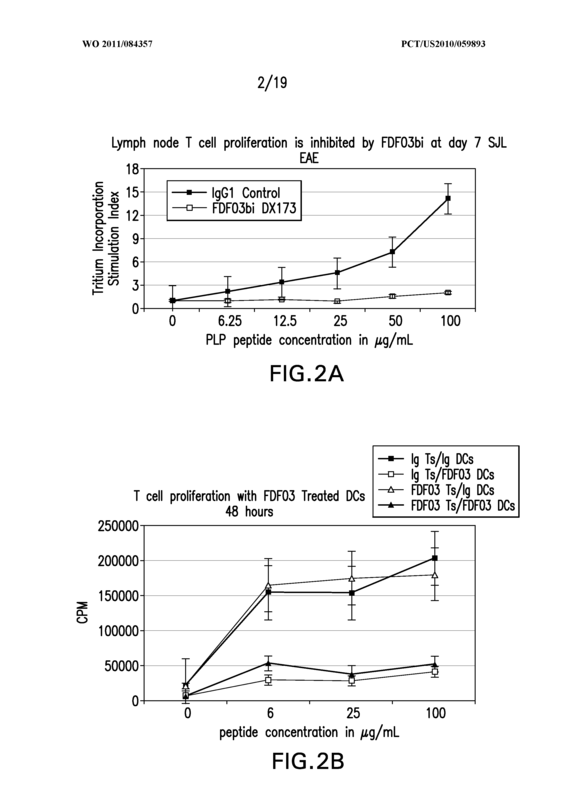 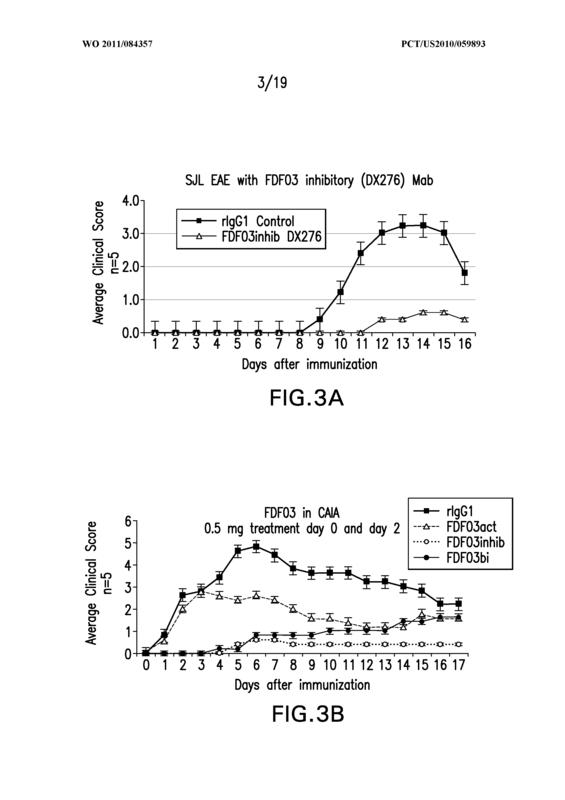 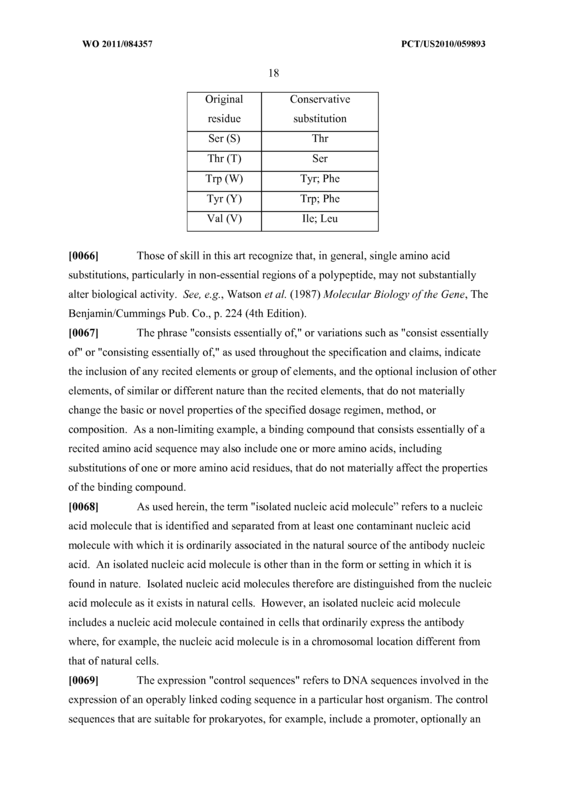 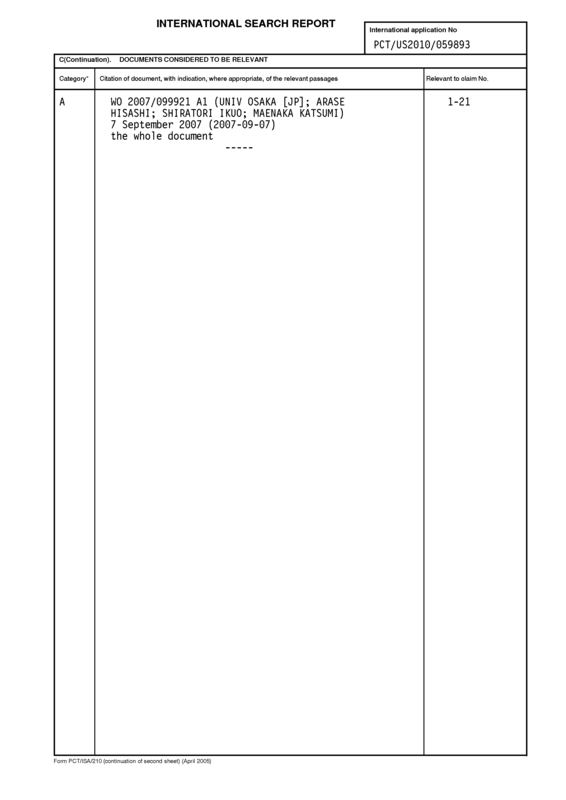 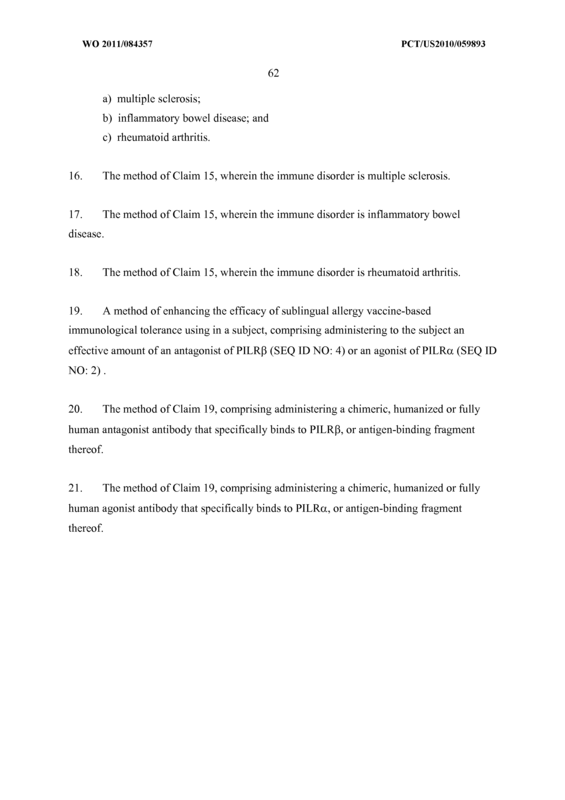 The method of Claim 1 comprising administering an antagonist of PILR (SEQ ID NO: 4). 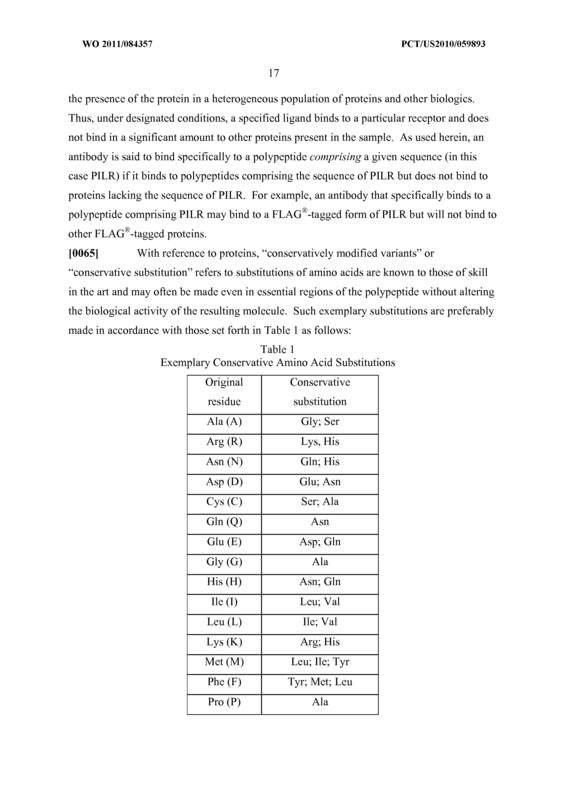 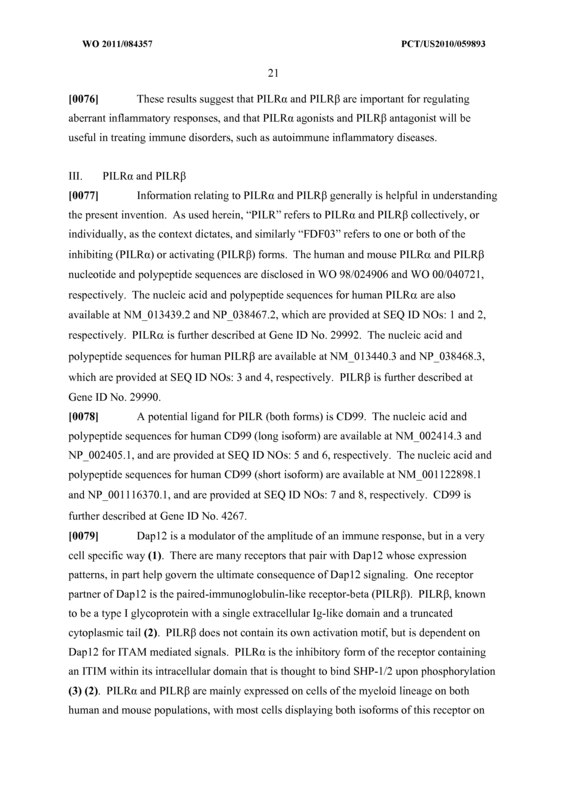 The method of Claim 2 wherein the antagonist of PILR comprises a nucleic acid inhibitor of PILRP expression selected from the group consisting of an interfering nucleic acid and an antisense nucleic acid. 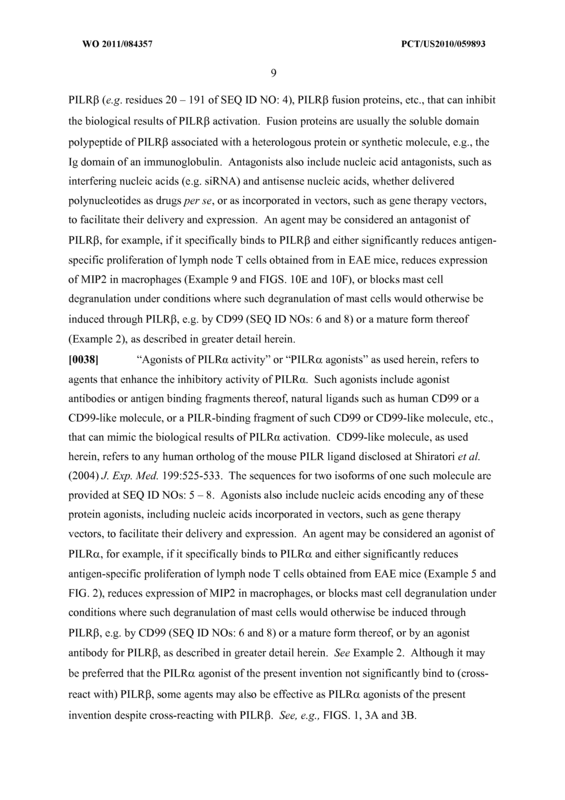 The method of Claim 2 wherein the antagonist of PILRP comprises an antigen- binding domain from an antagonist antibody that specifically binds to PILRp. 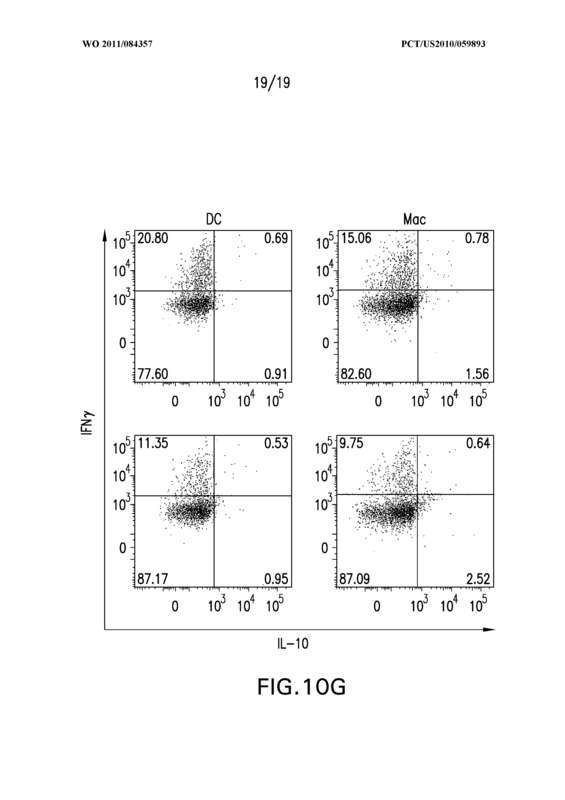 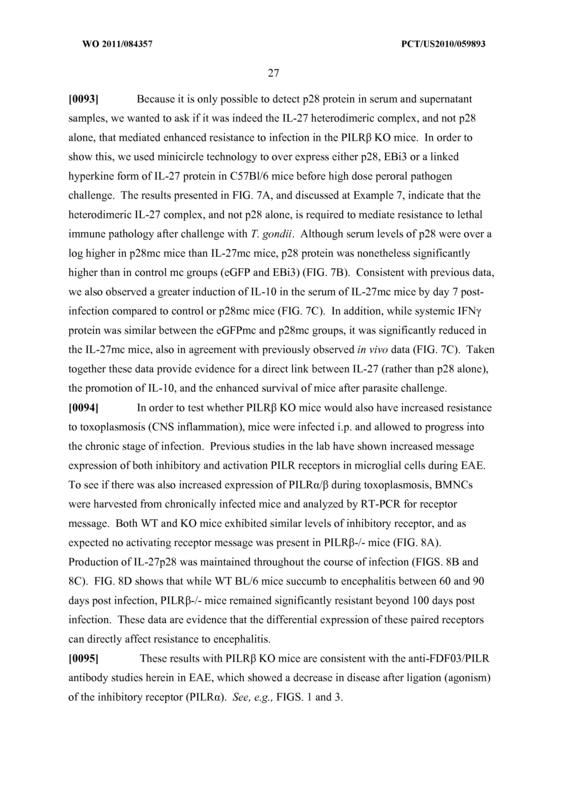 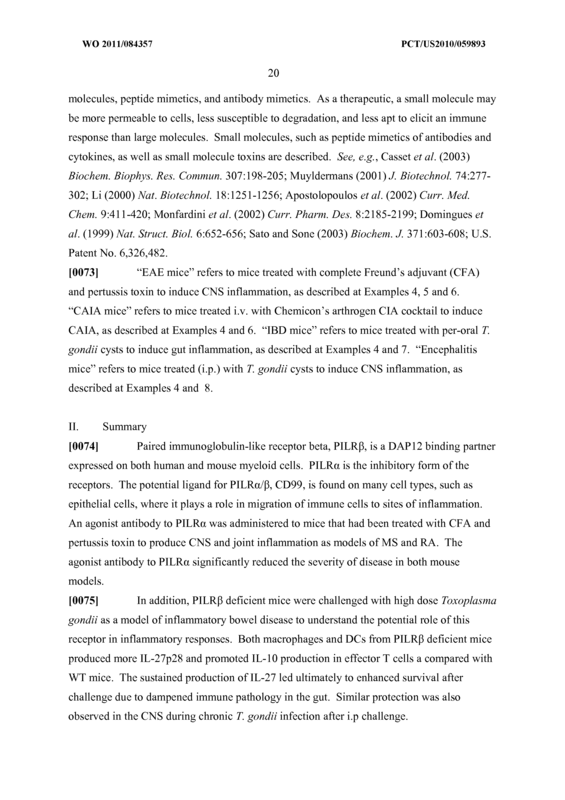 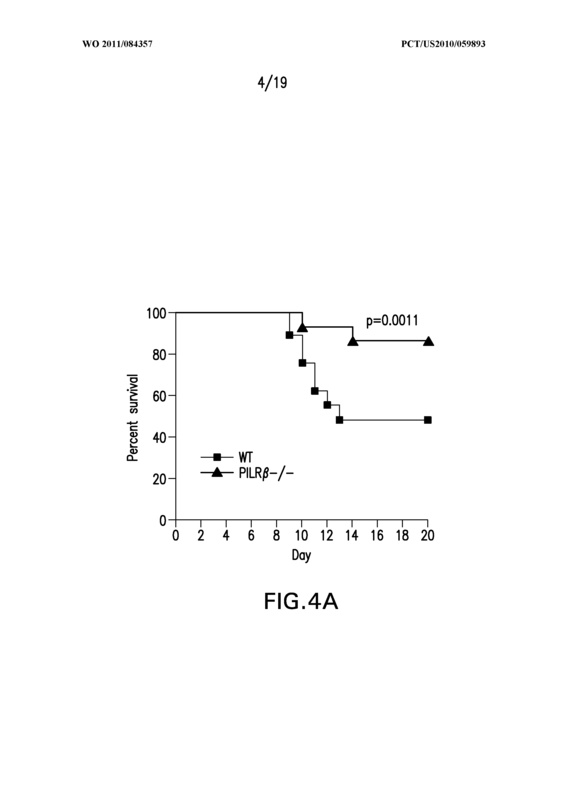 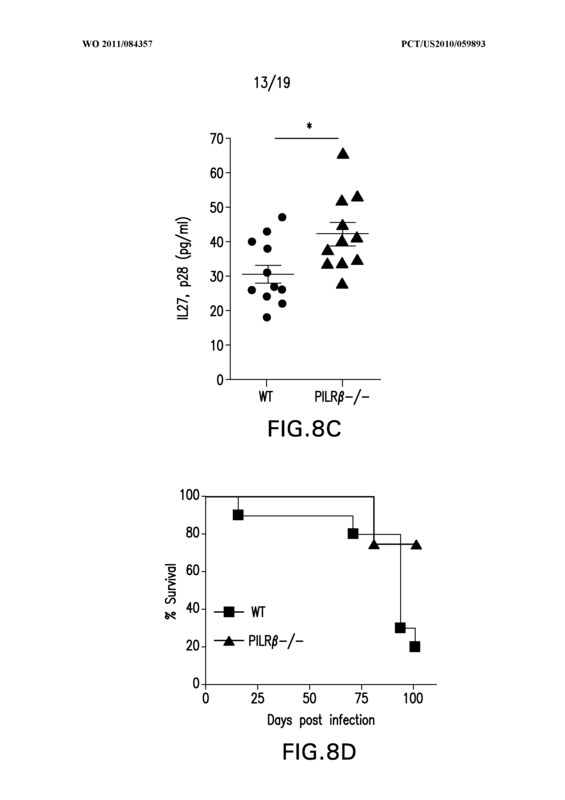 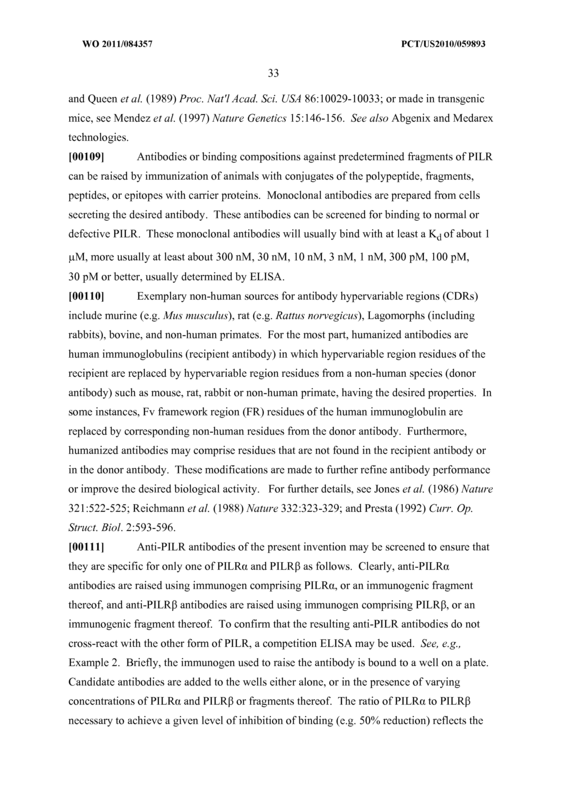 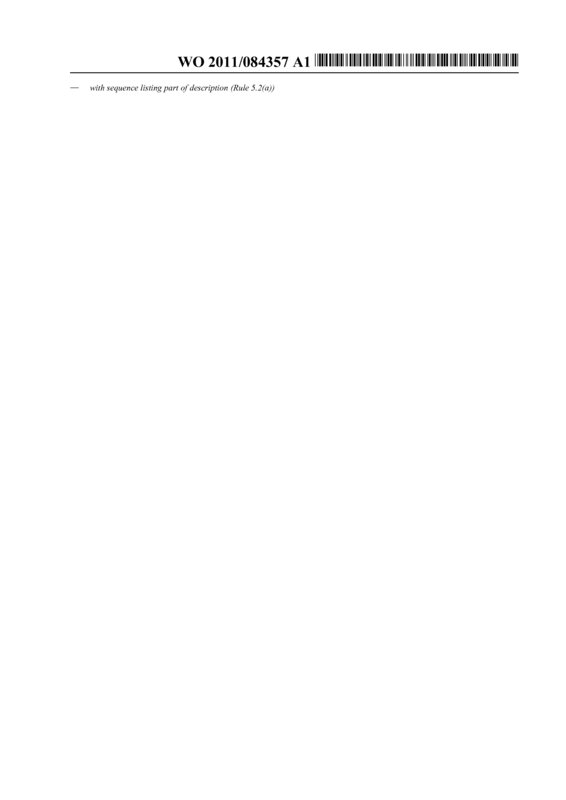 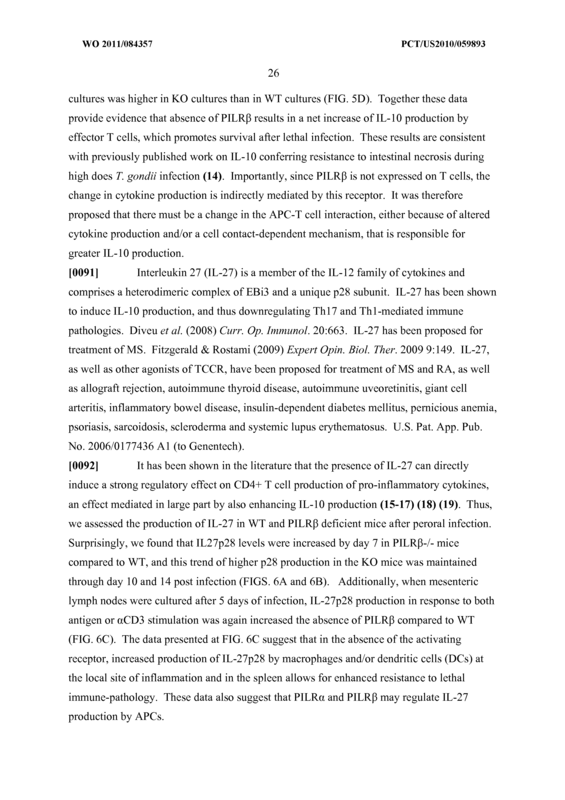 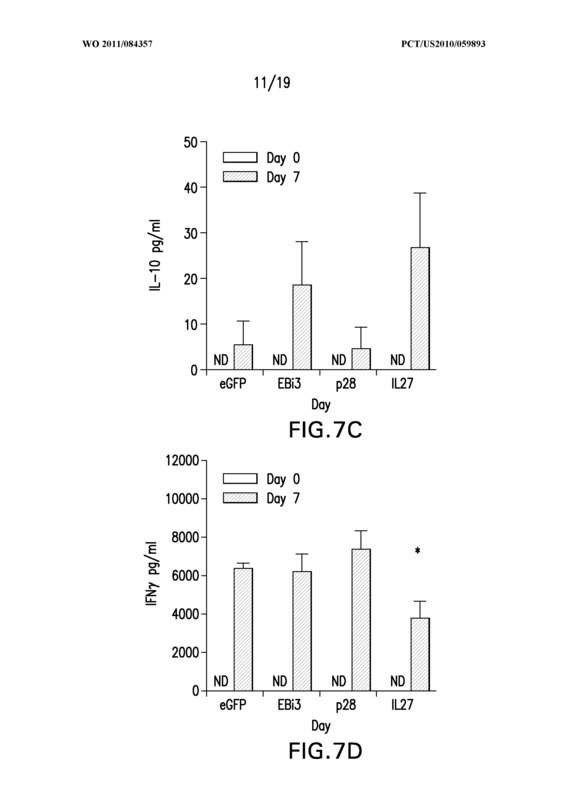 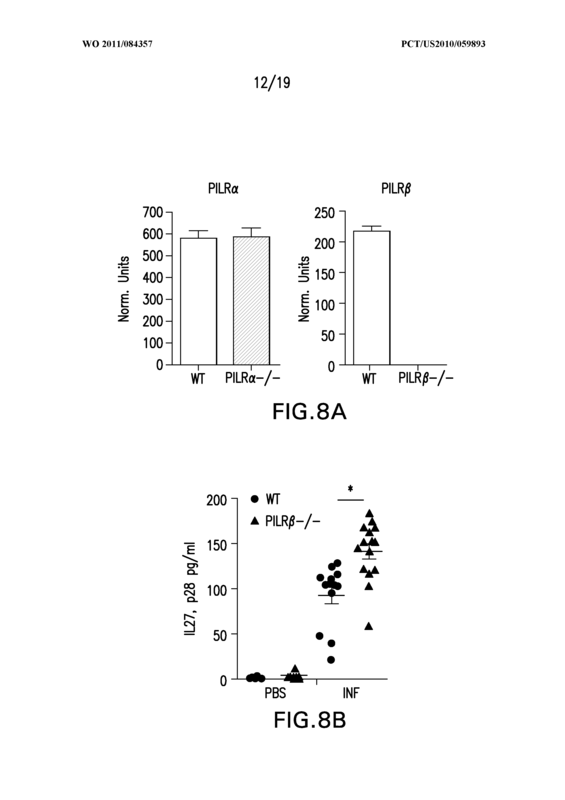 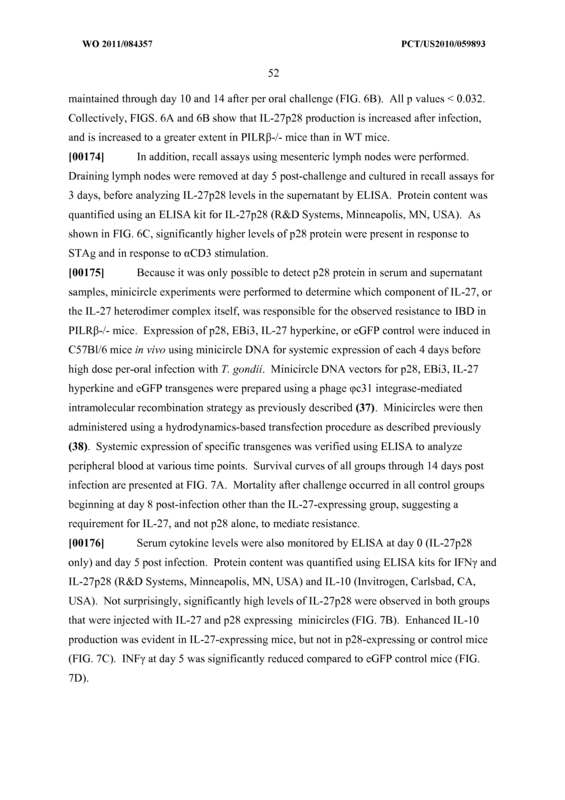 The method of Claim 4 wherein the antagonist of PILRP comprises an antibody. 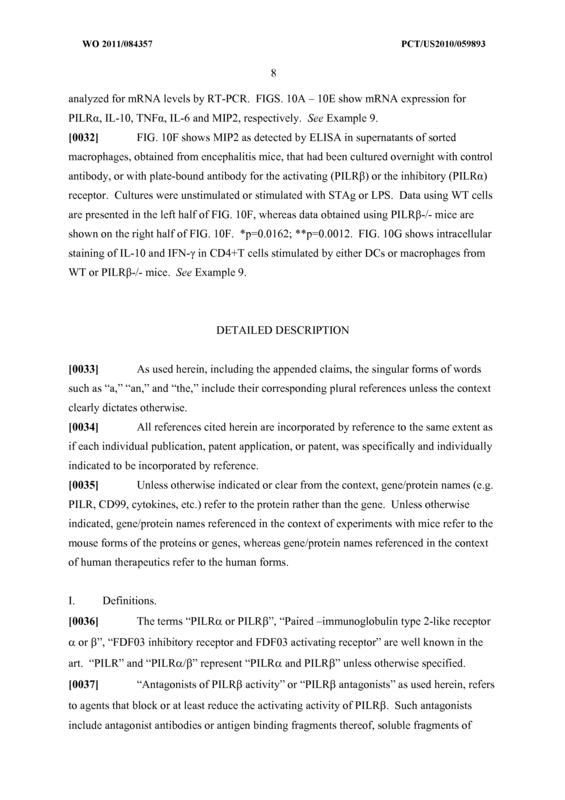 The method of Claim 4 wherein the antagonist of PILRP comprises an antigen- binding domain from an antagonist antibody that specifically binds to PILRp, wherein the antagonist antibody is a chimeric, humanized, or fully human antibody . 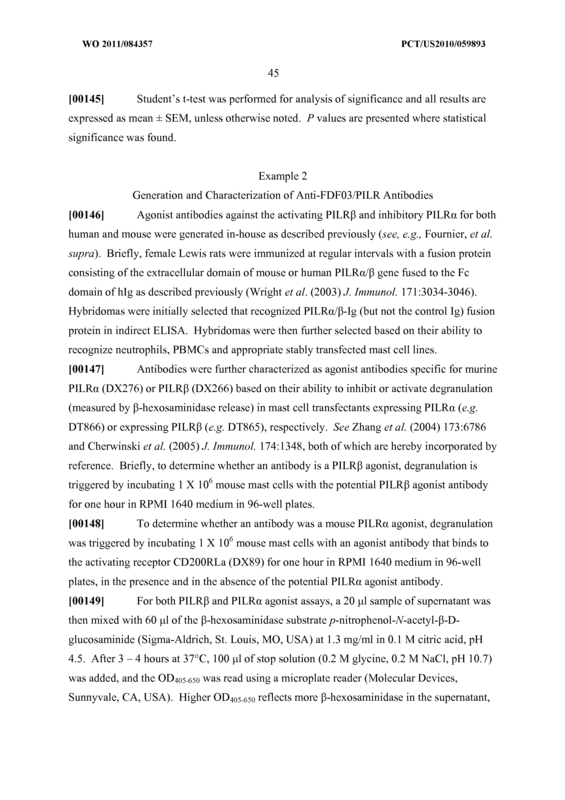 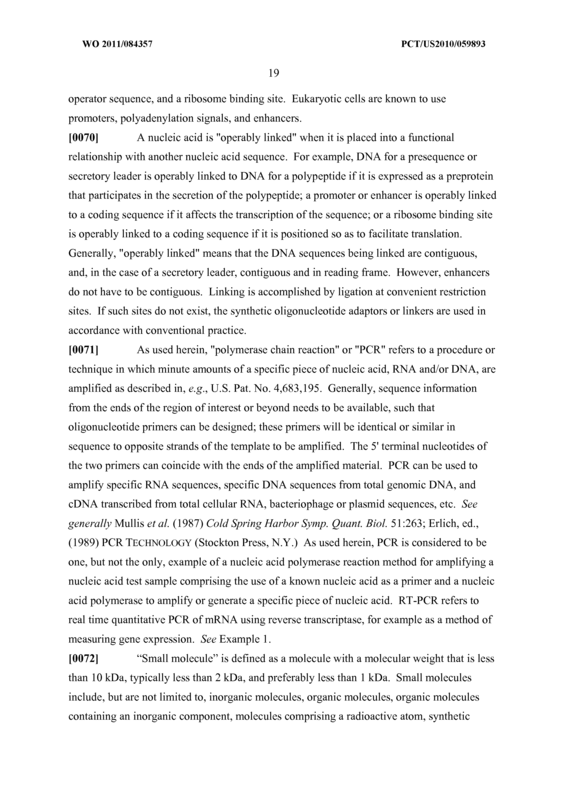 The method of Claim 2 wherein the antagonist of PILRP comprises a soluble polypeptide fragment of PILRp (SEQ ID NO: 4). 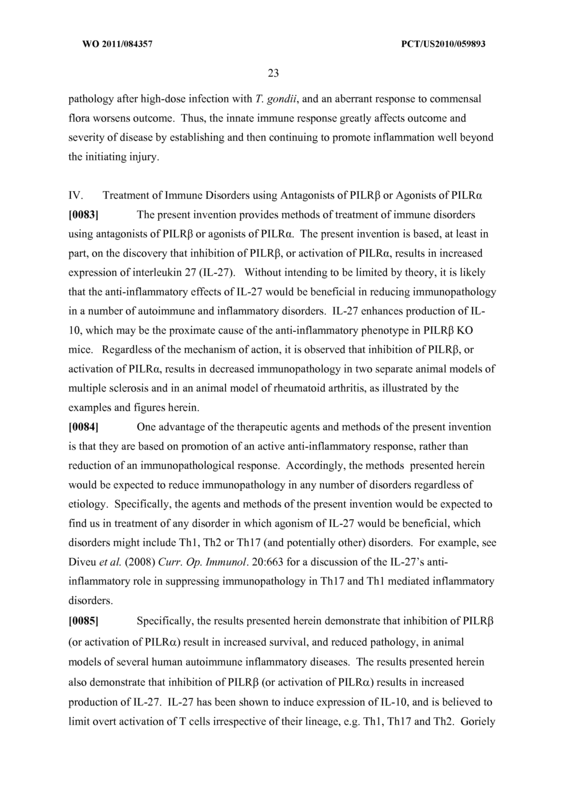 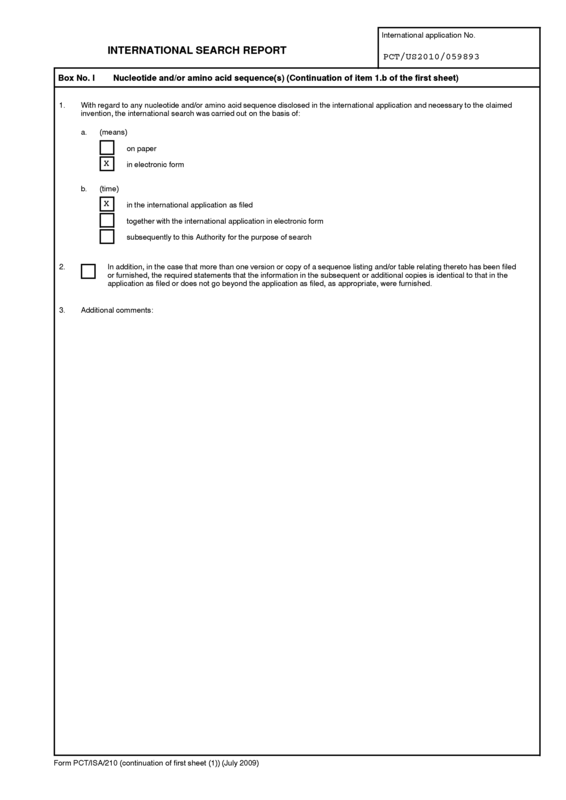 The method of Claim 1 comprising administering an agonist of PILRa (SEQ ID NO: 2). 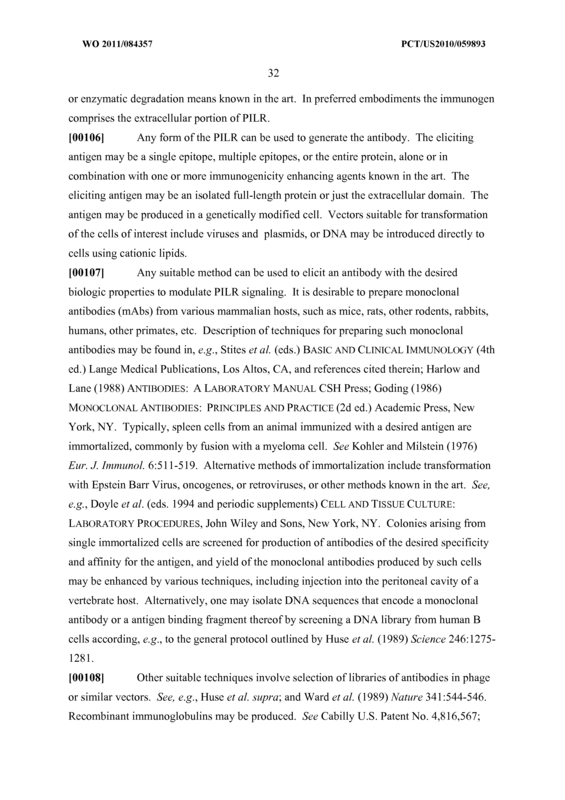 The method of Claim 8 wherein the agonist of PILRa comprises an antigen-binding domain from an agonist antibody that specifically binds to PILRa. 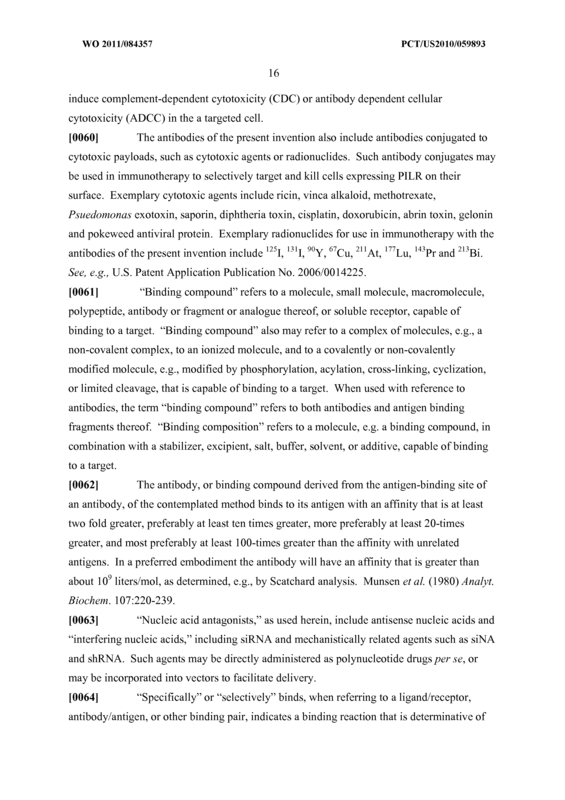 The method of Claim 9 wherein the agonist of PILRa comprises an agonist antibody that specifically binds to PILRa . 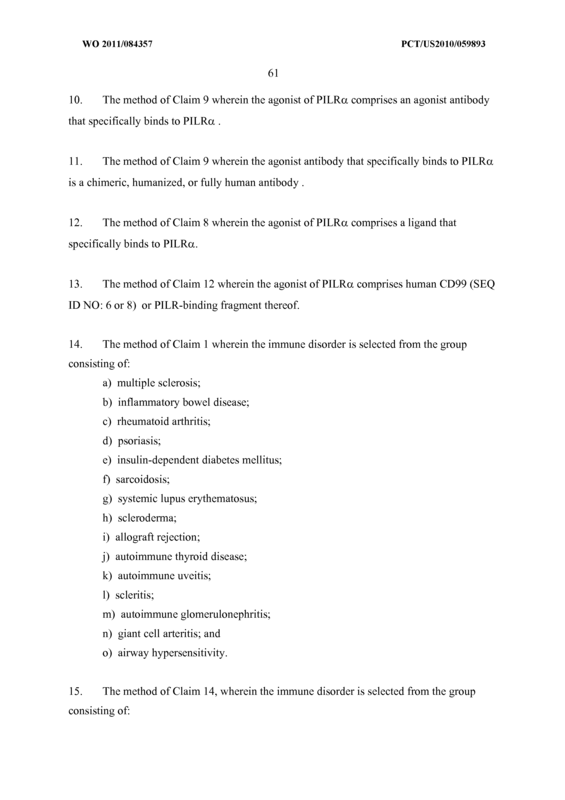 The method of Claim 9 wherein the agonist antibody that specifically binds to PILRa is a chimeric, humanized, or fully human antibody . 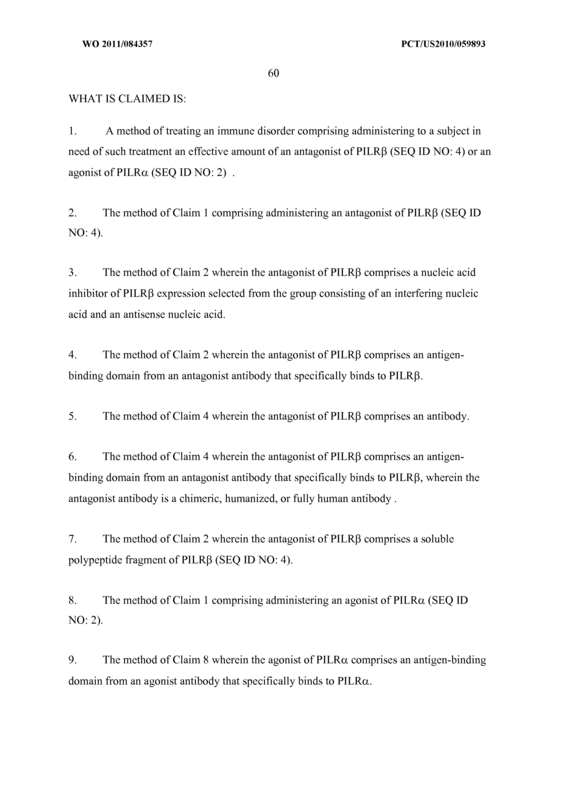 The method of Claim 8 wherein the agonist of PILRa comprises a ligand that specifically binds to PILRa. 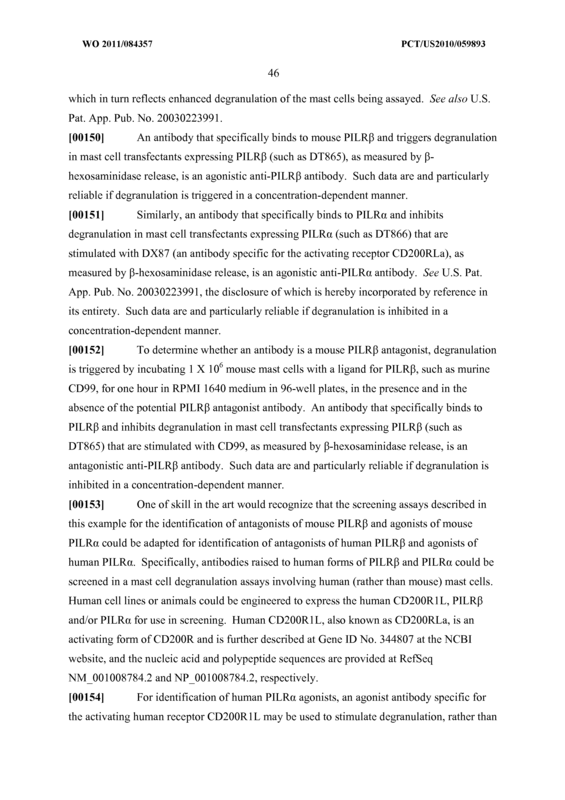 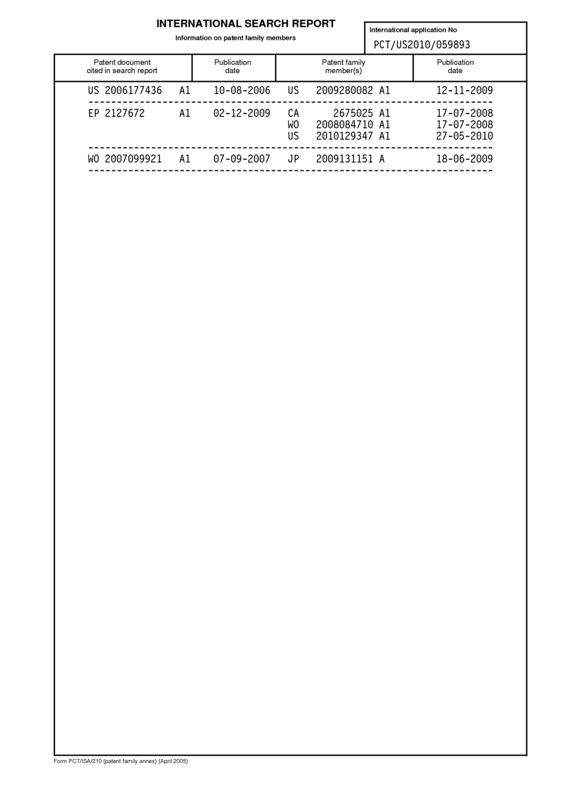 The method of Claim 12 wherein the agonist of PILRa comprises human CD99 (SEQ ID NO: 6 or 8) or PILR-binding fragment thereof. 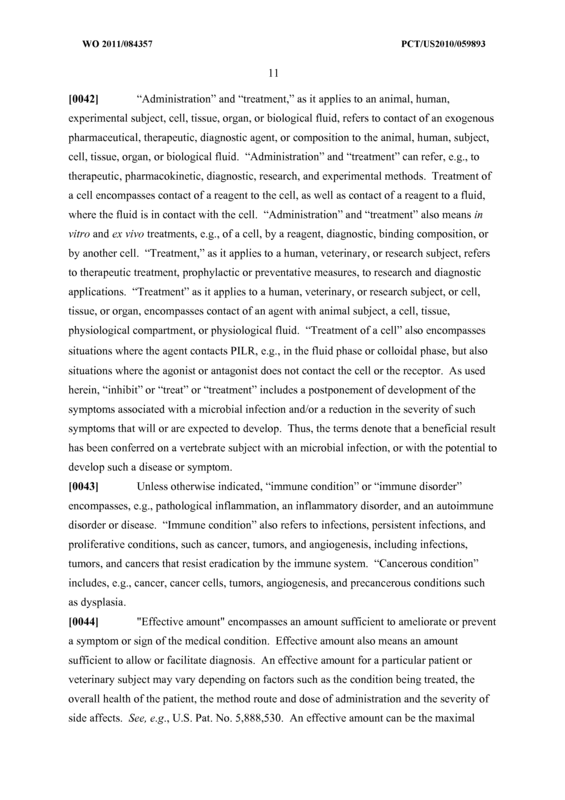 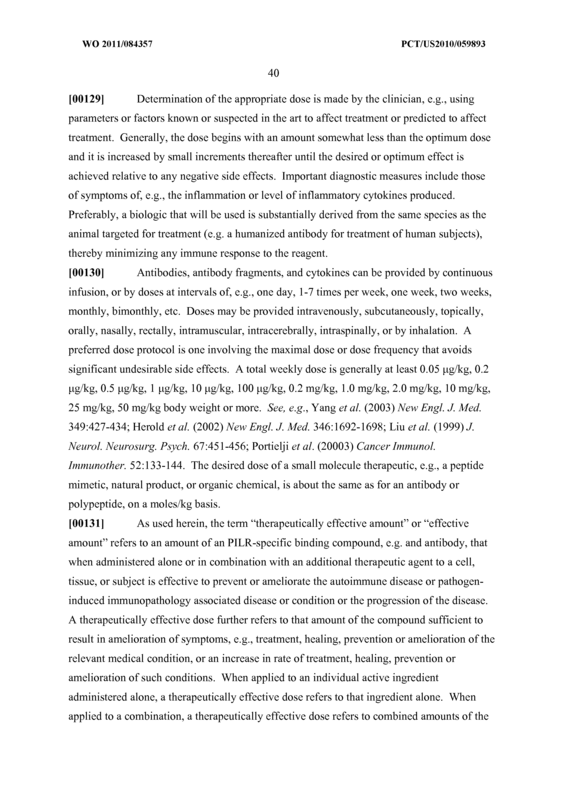 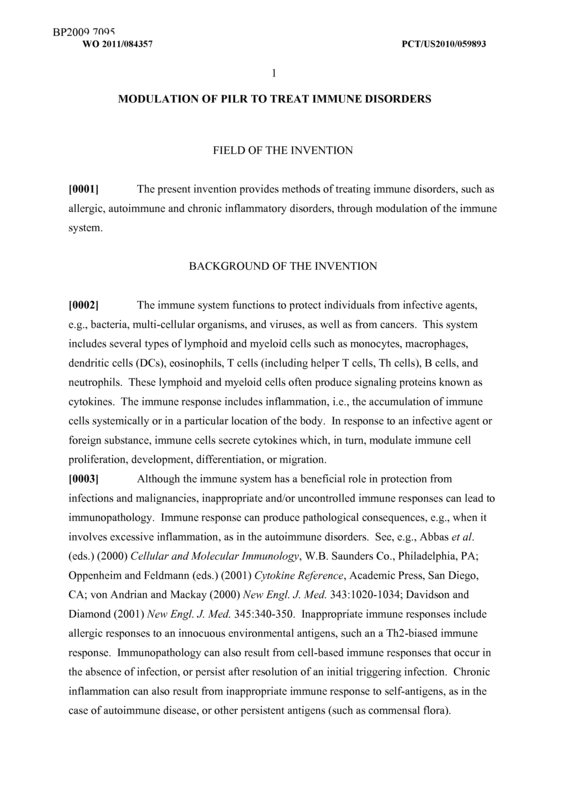 The method of Claim 15, wherein the immune disorder is multiple sclerosis. 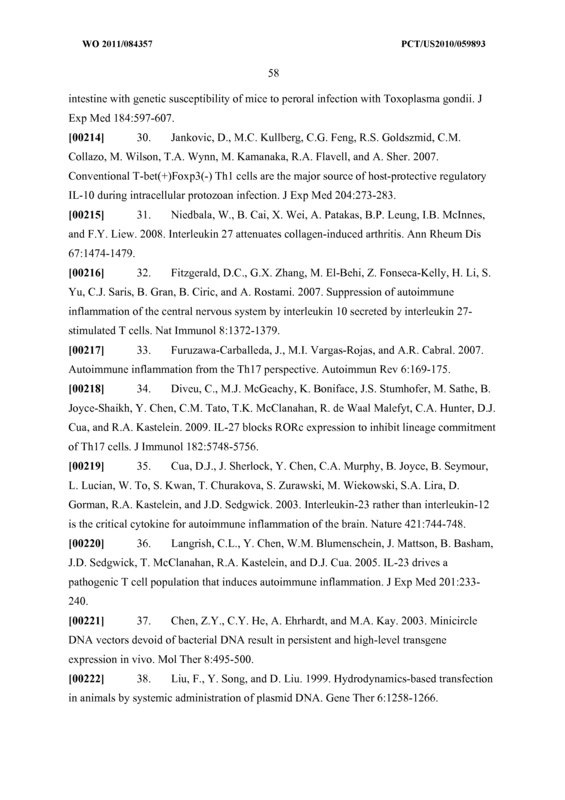 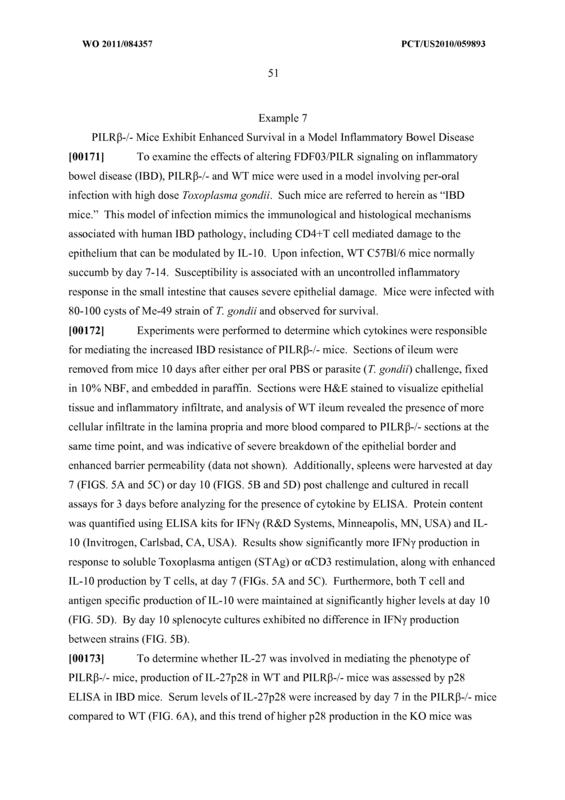 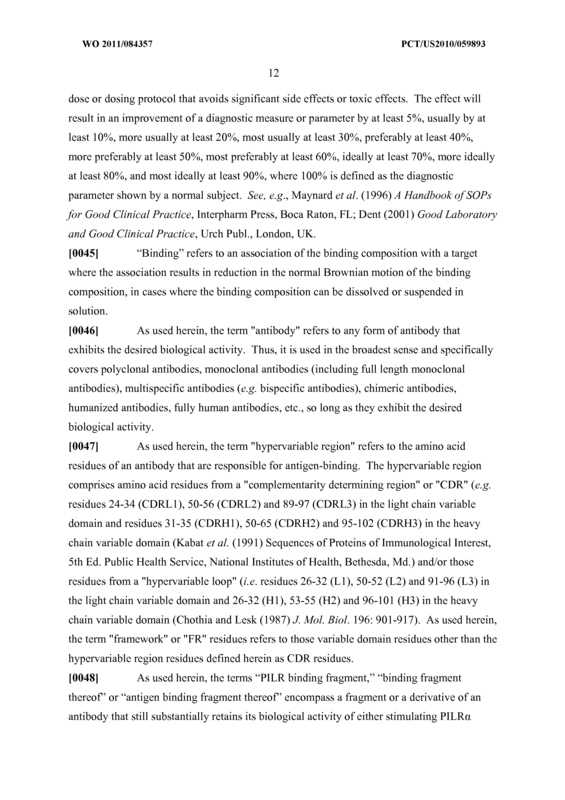 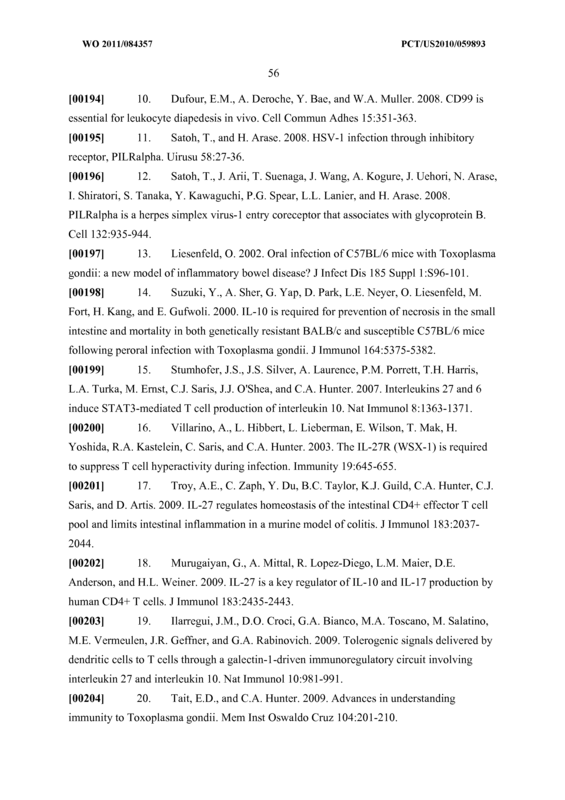 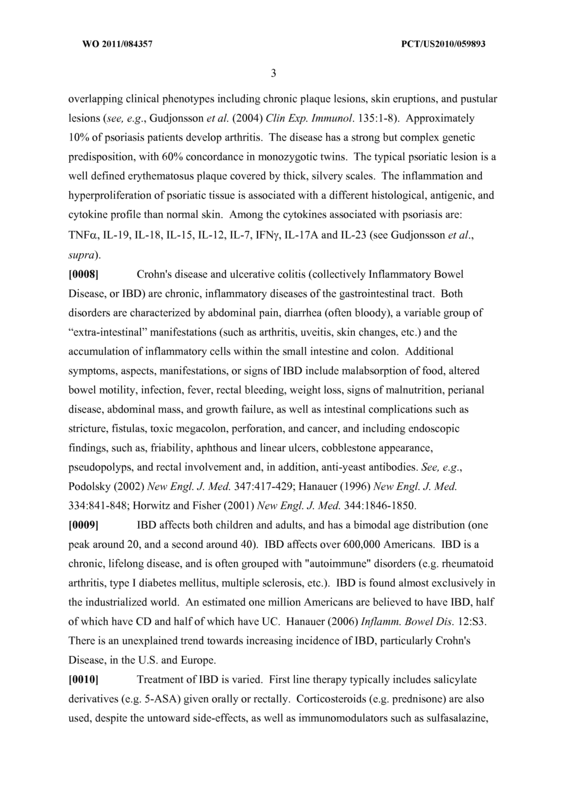 The method of Claim 15, wherein the immune disorder is inflammatory bowel disease. 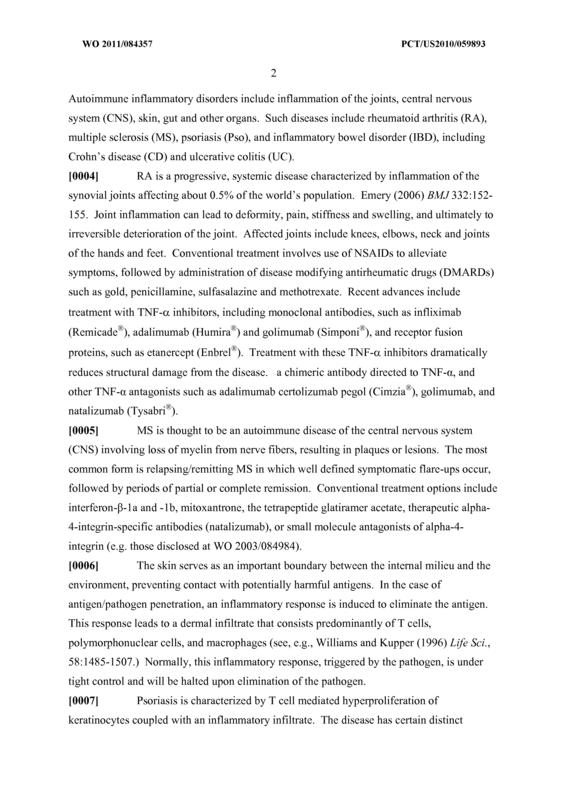 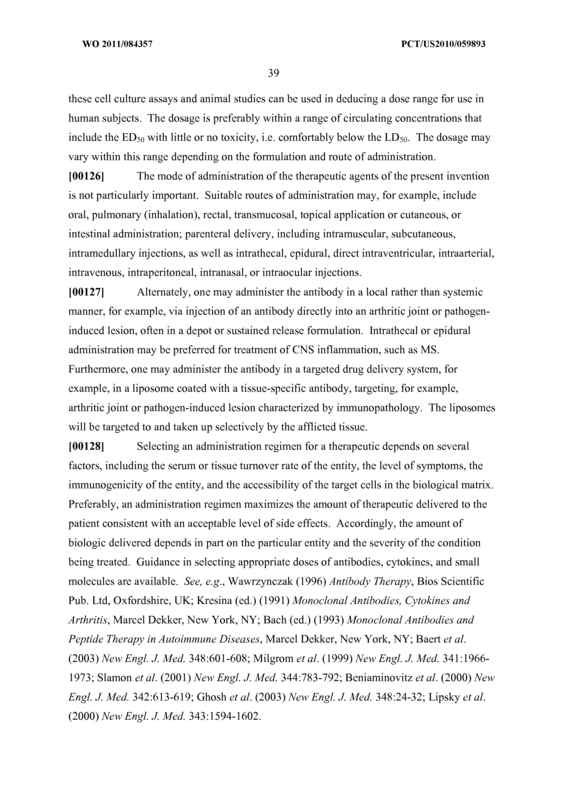 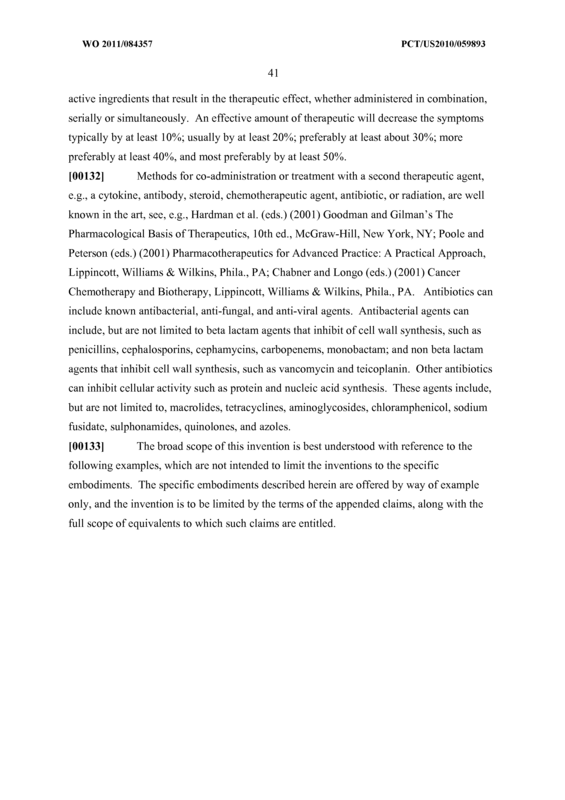 The method of Claim 15, wherein the immune disorder is rheumatoid arthritis. 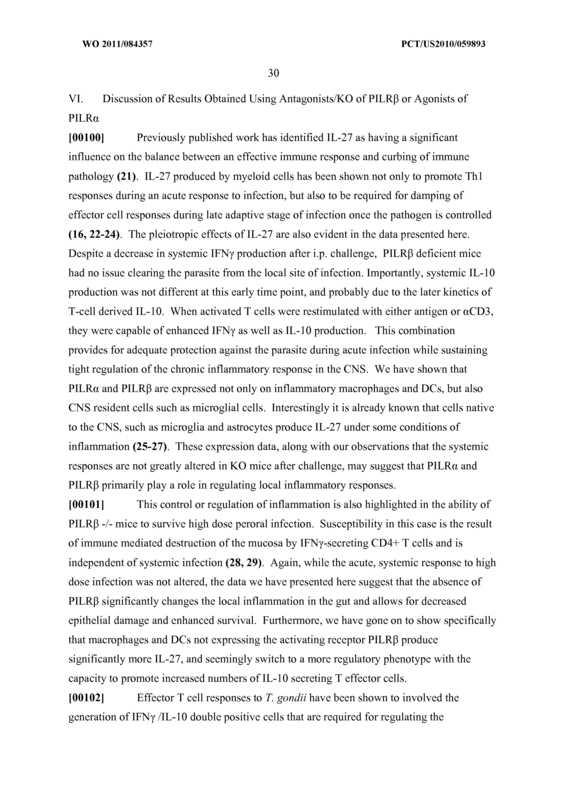 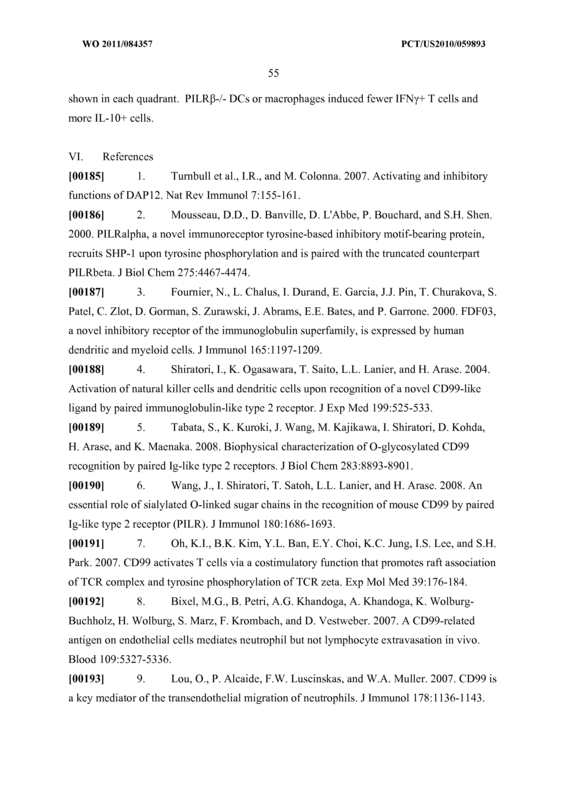 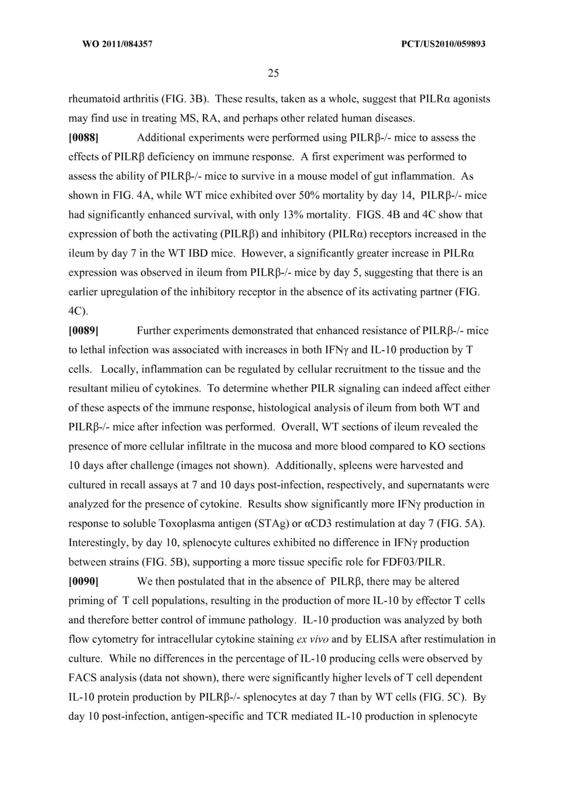 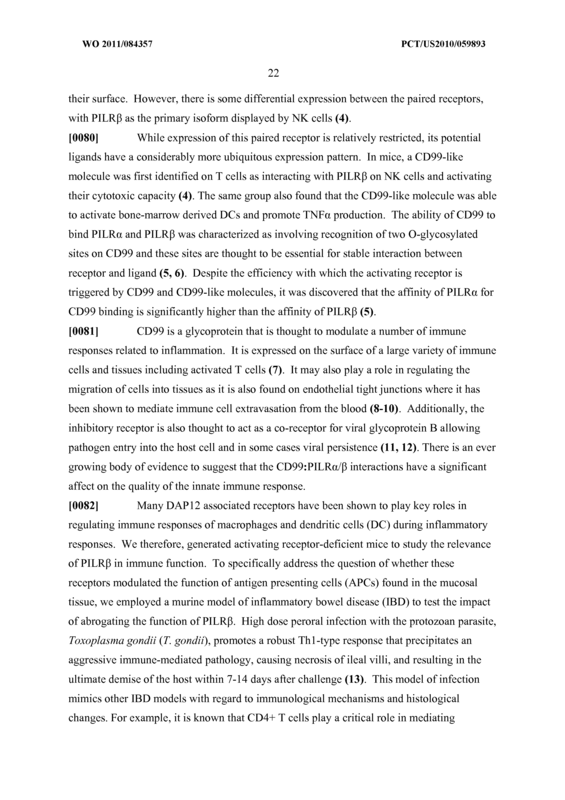 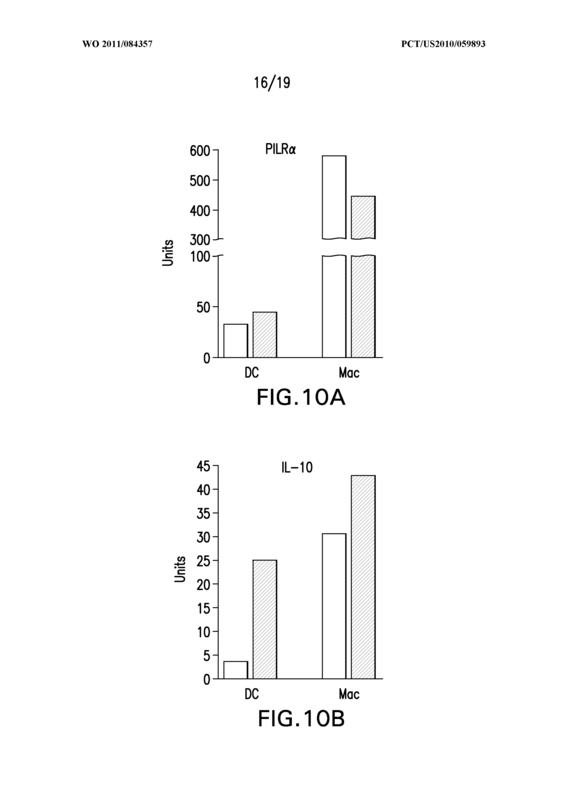 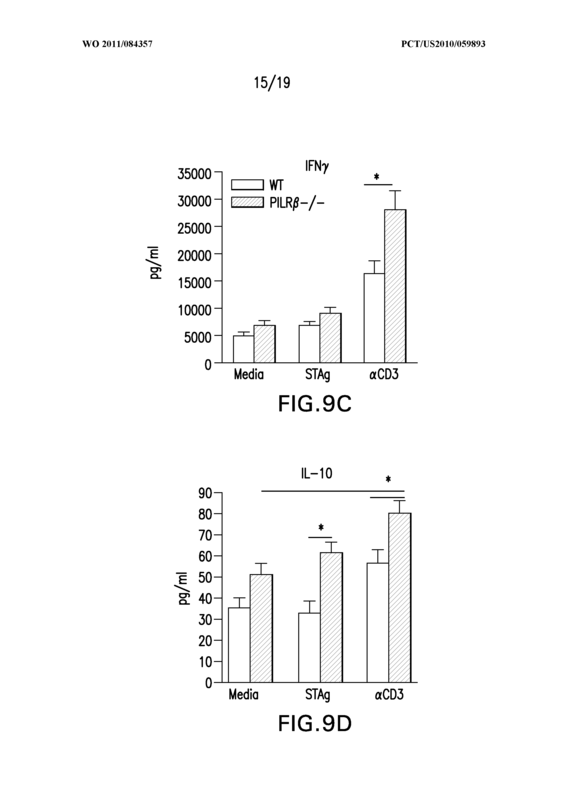 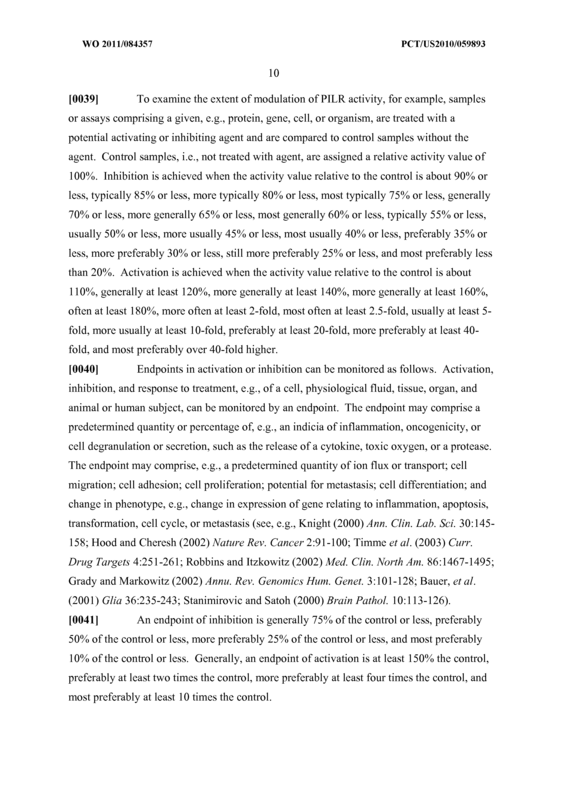 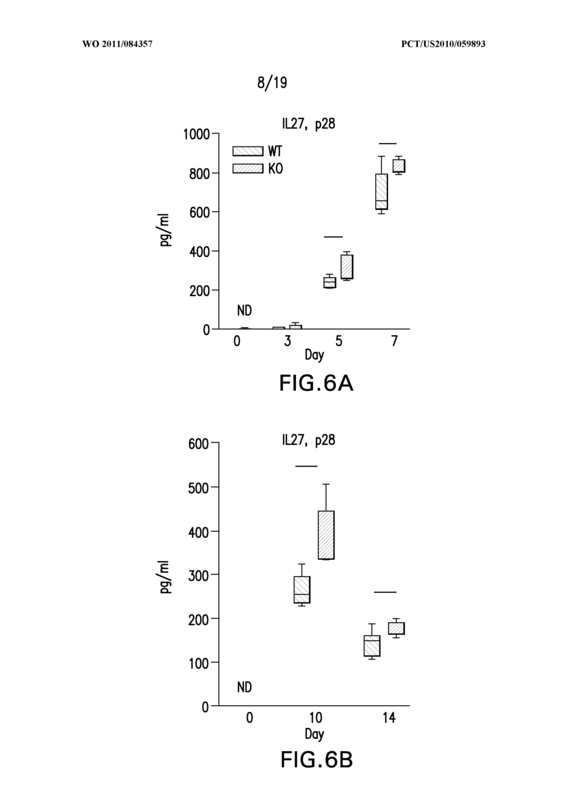 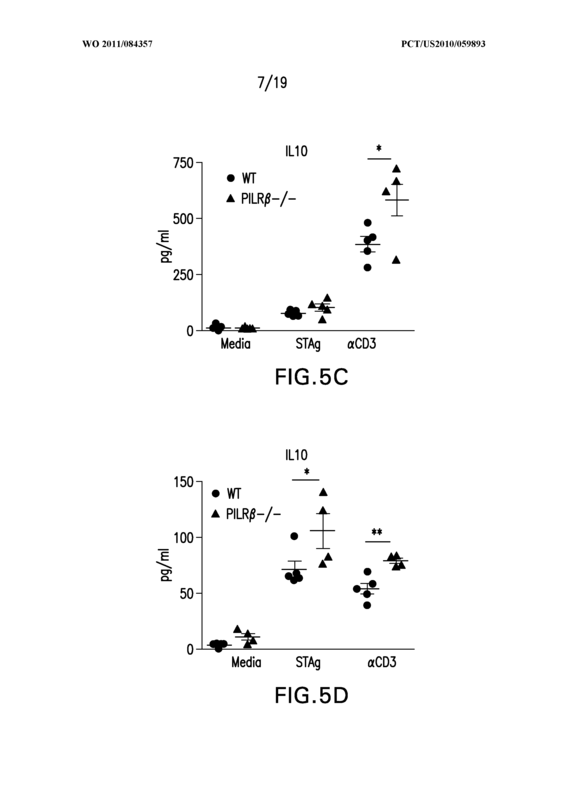 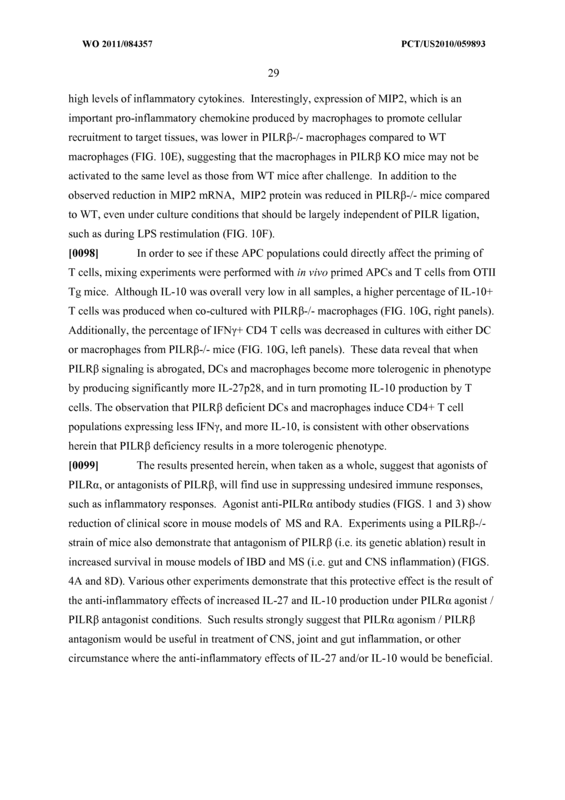 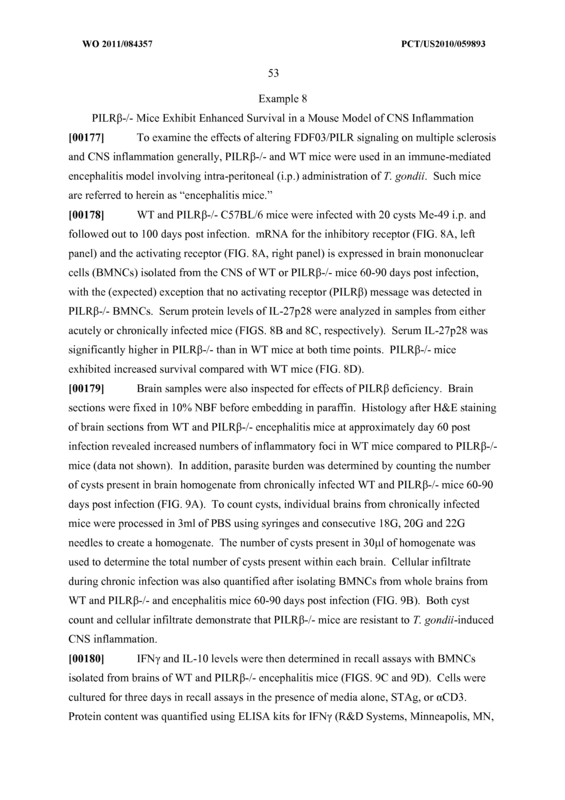 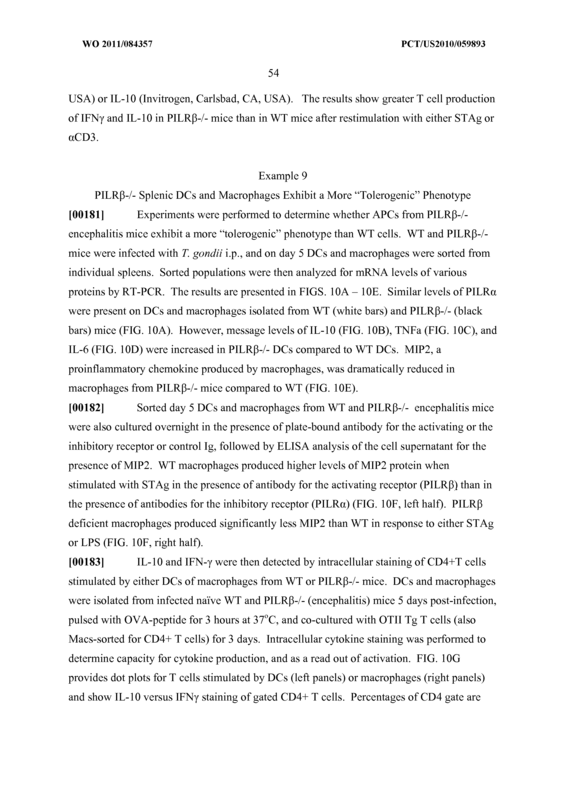 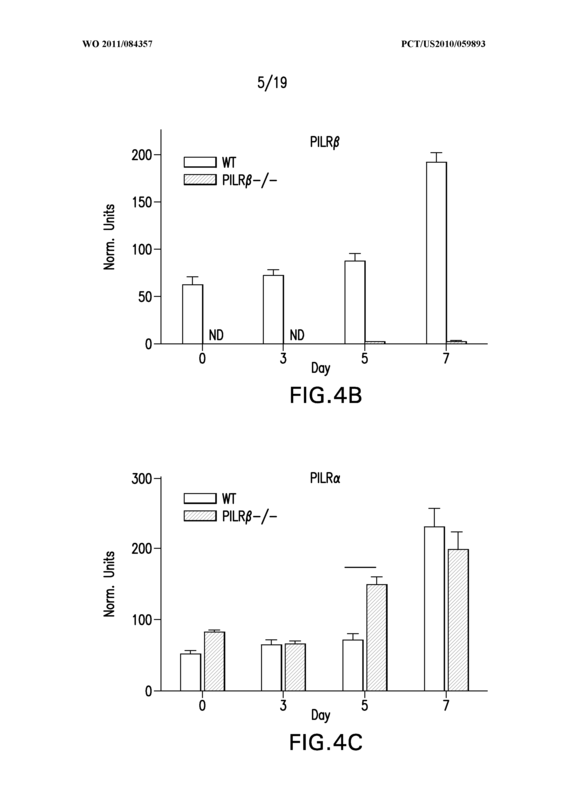 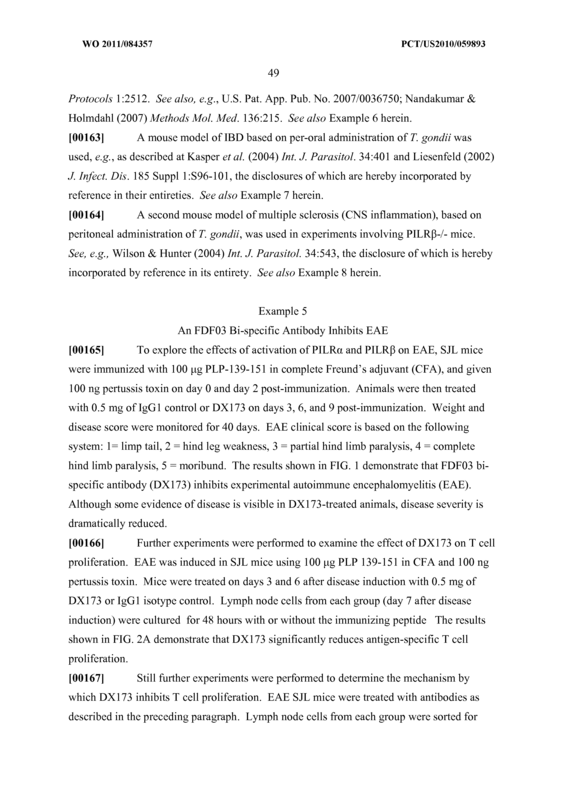 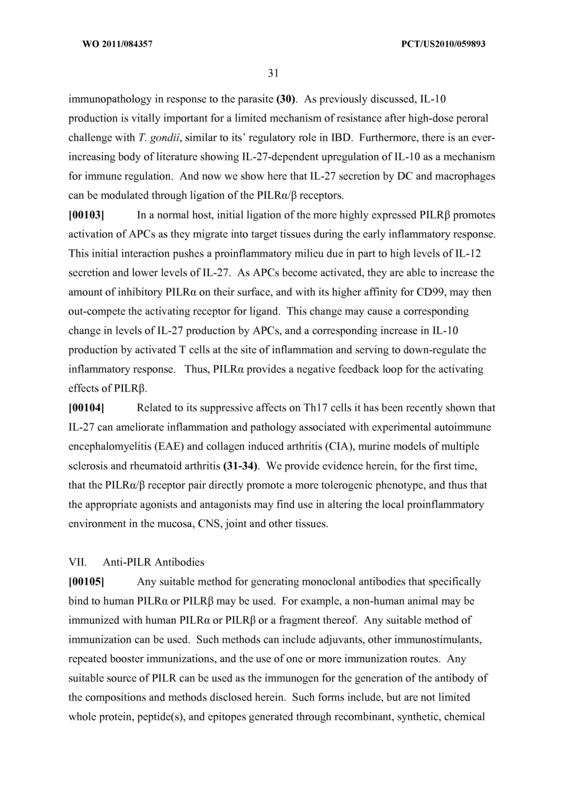 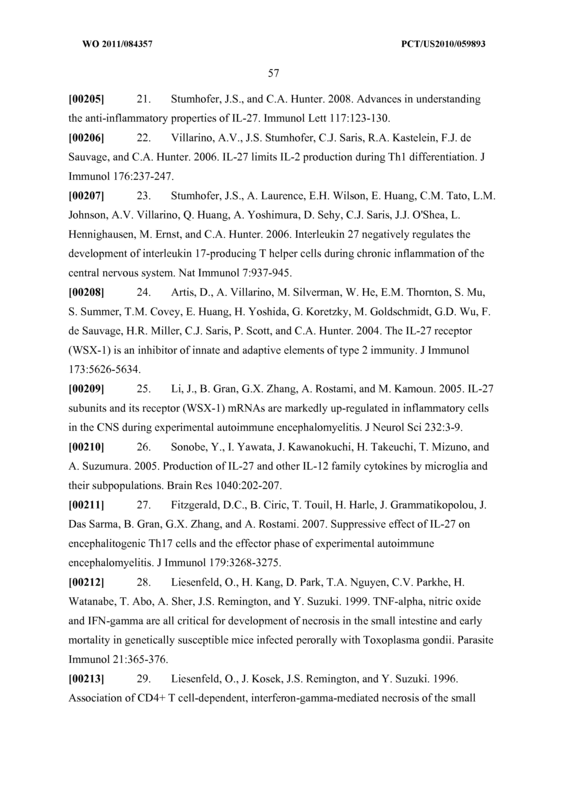 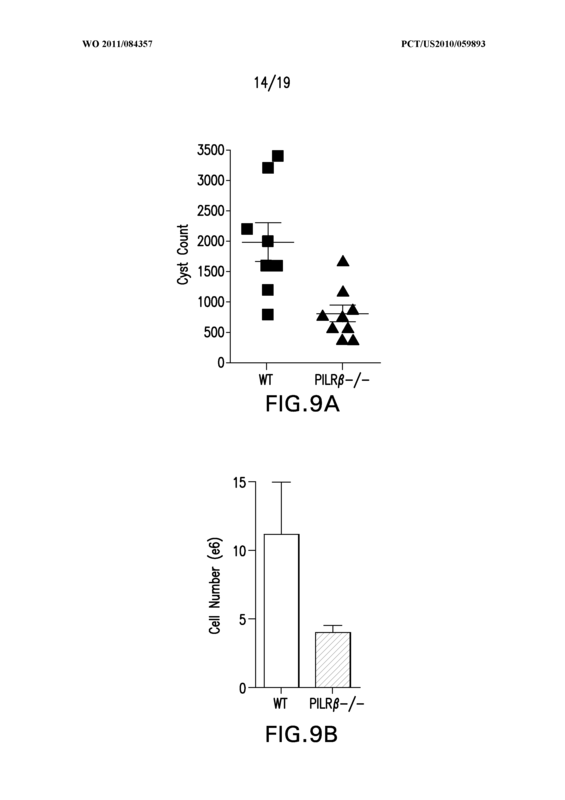 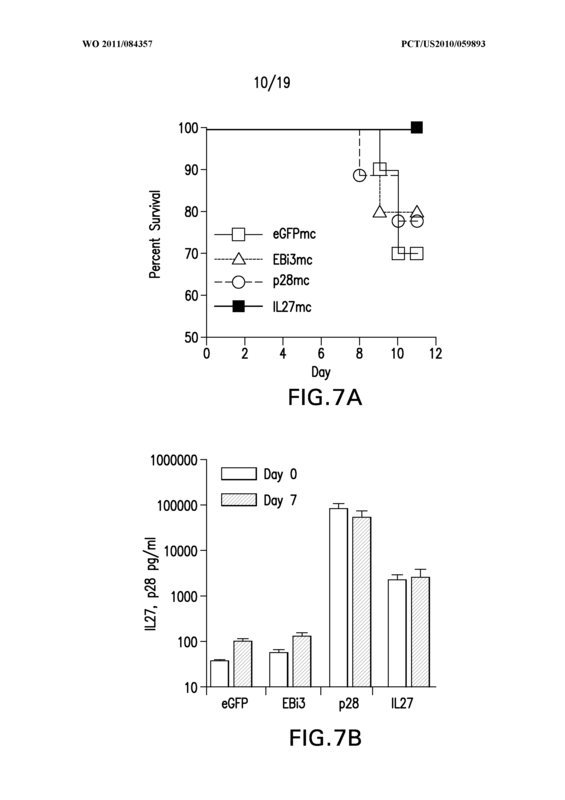 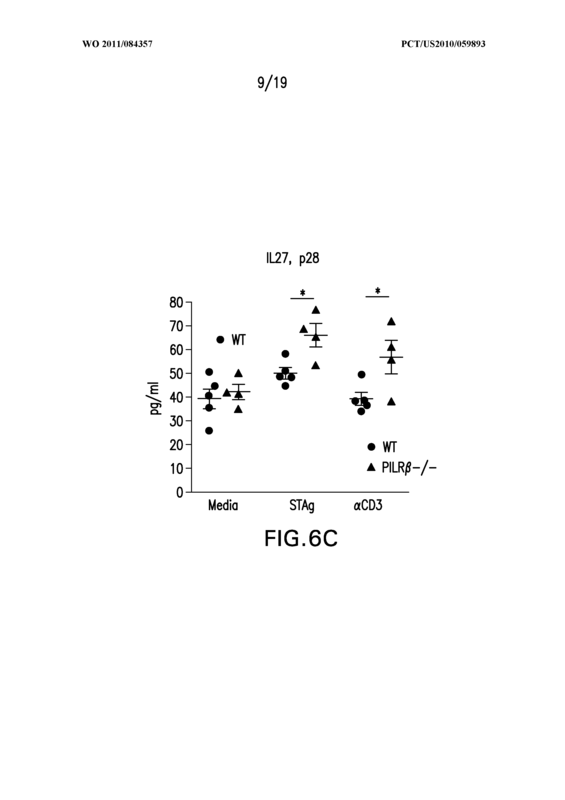 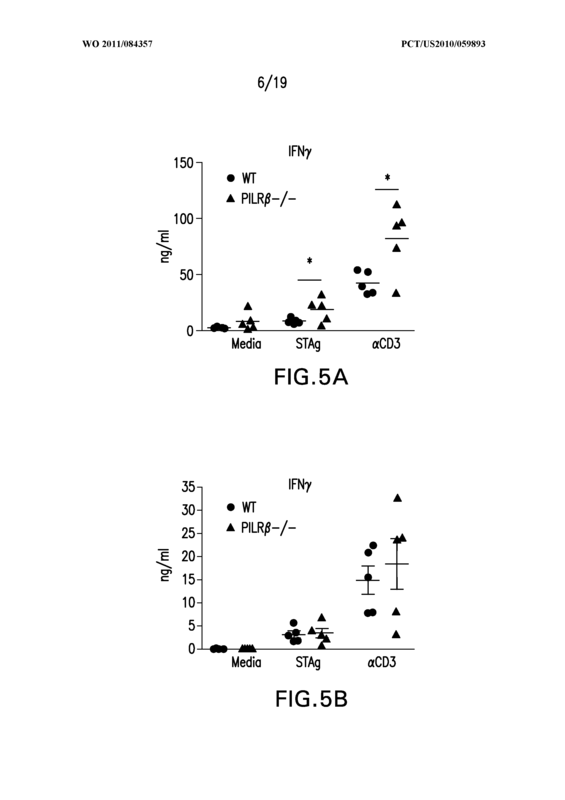 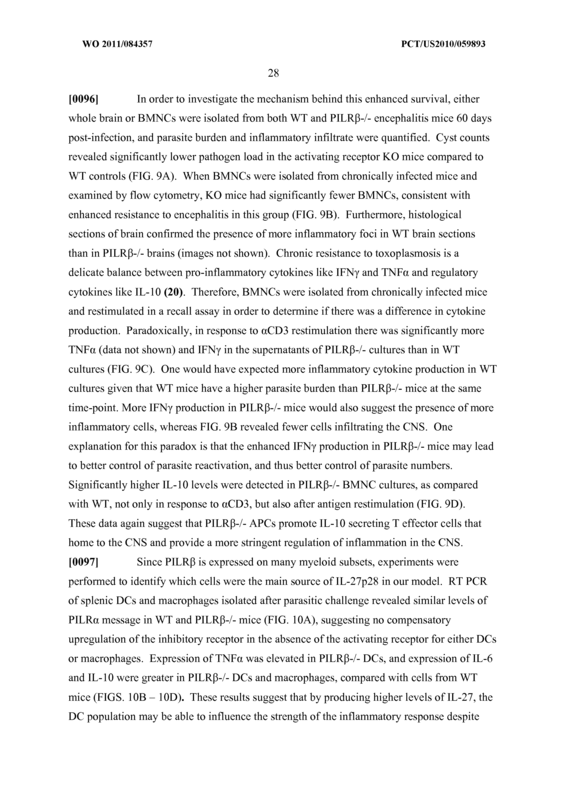 immunological tolerance using in a subject, comprising administering to the subject an effective amount of an antagonist of PILRp (SEQ ID NO: 4) or an agonist of PILRa (SEQ ID NO: 2) . 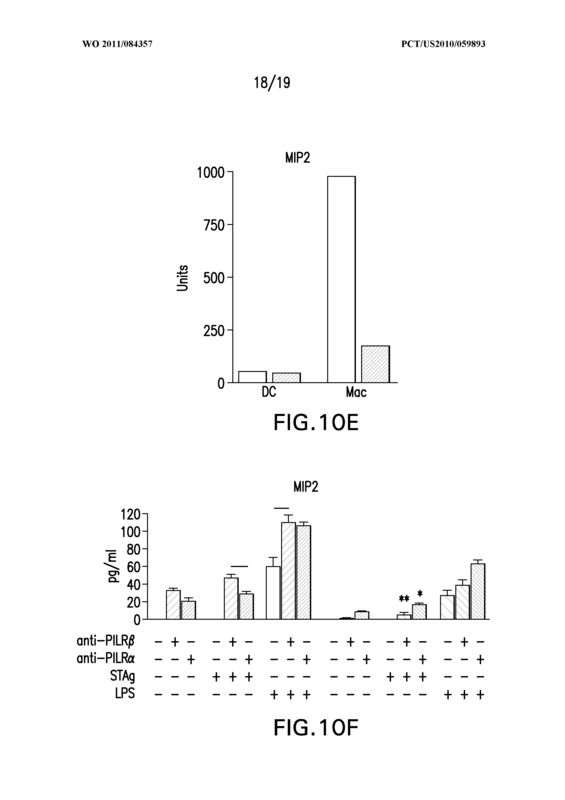 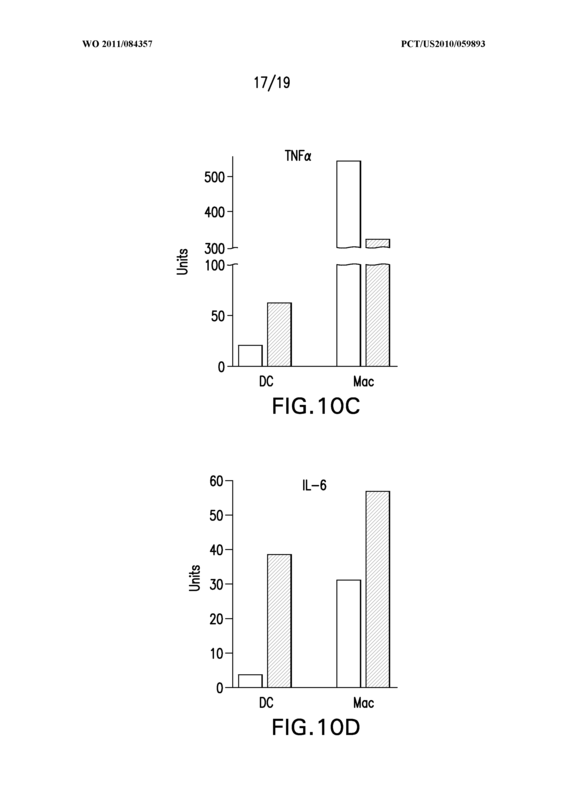 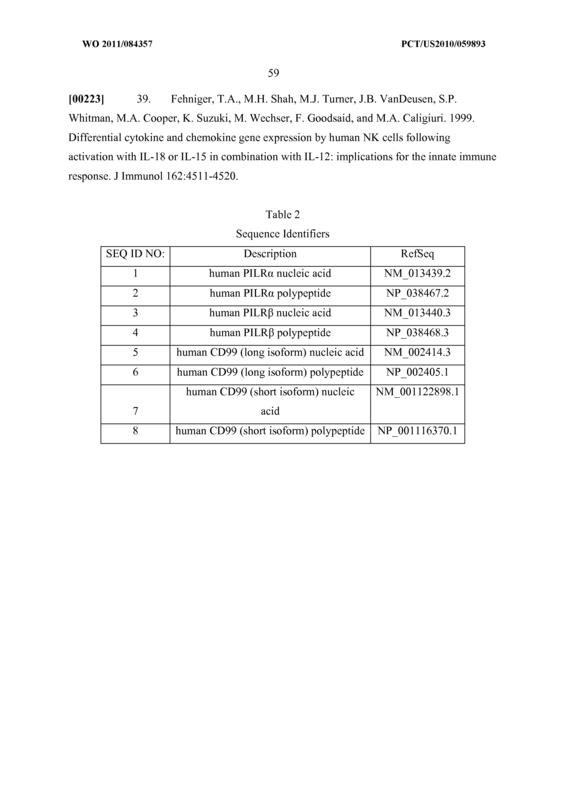 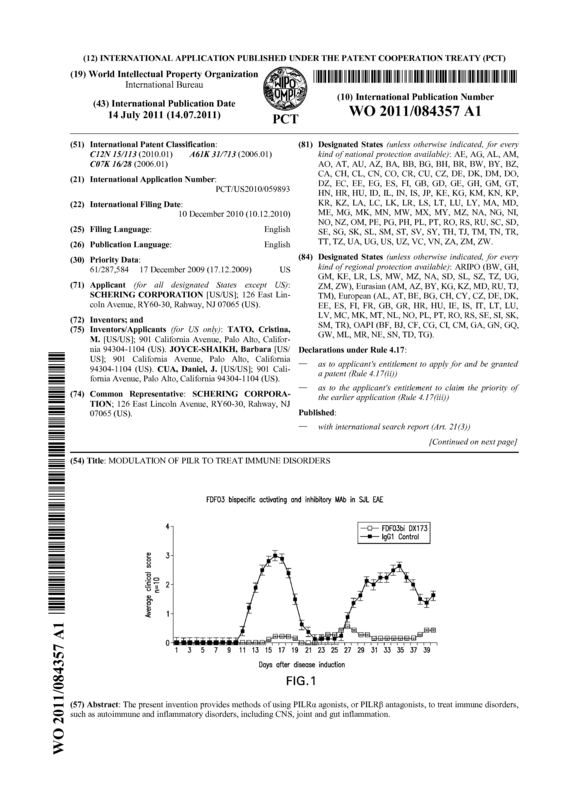 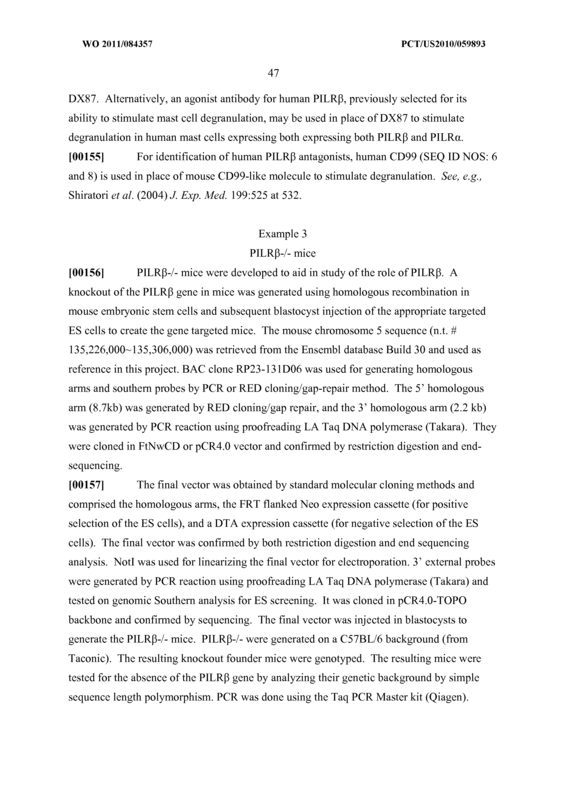 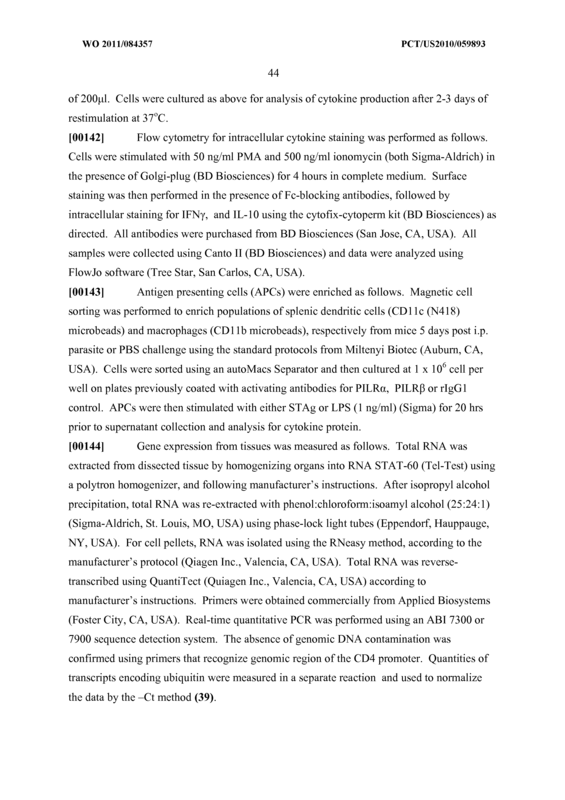 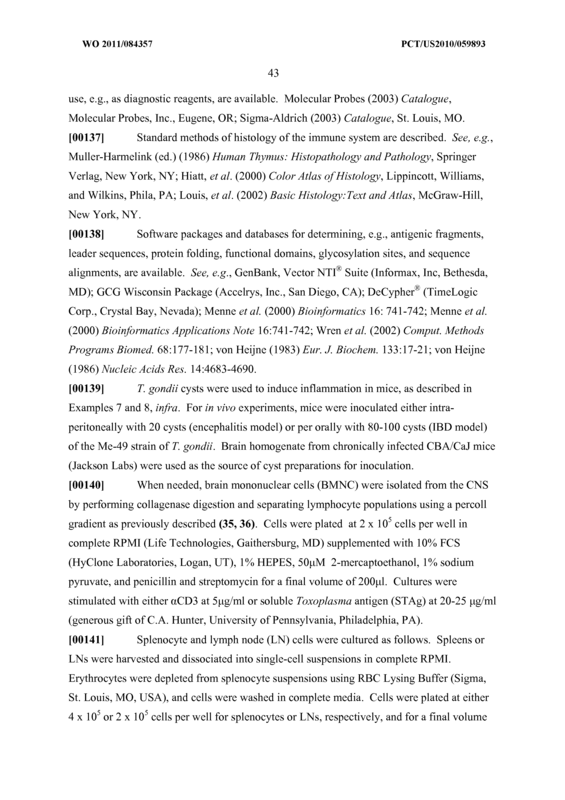 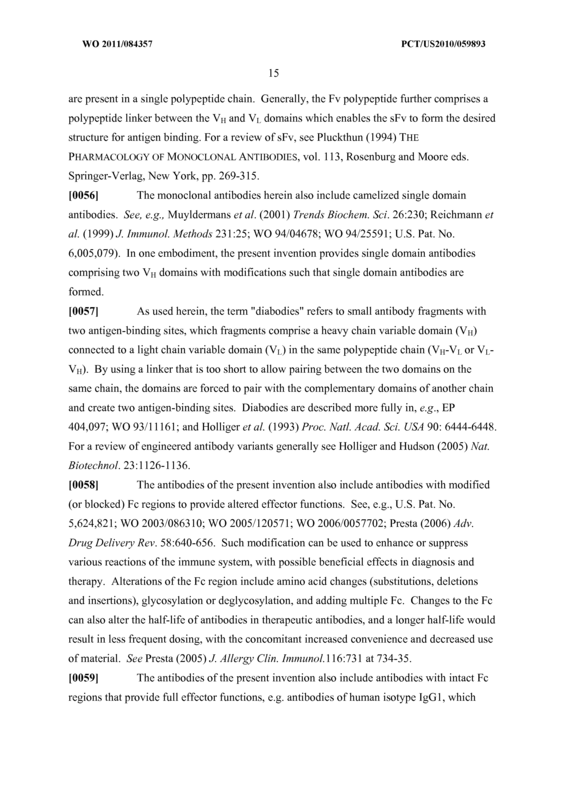 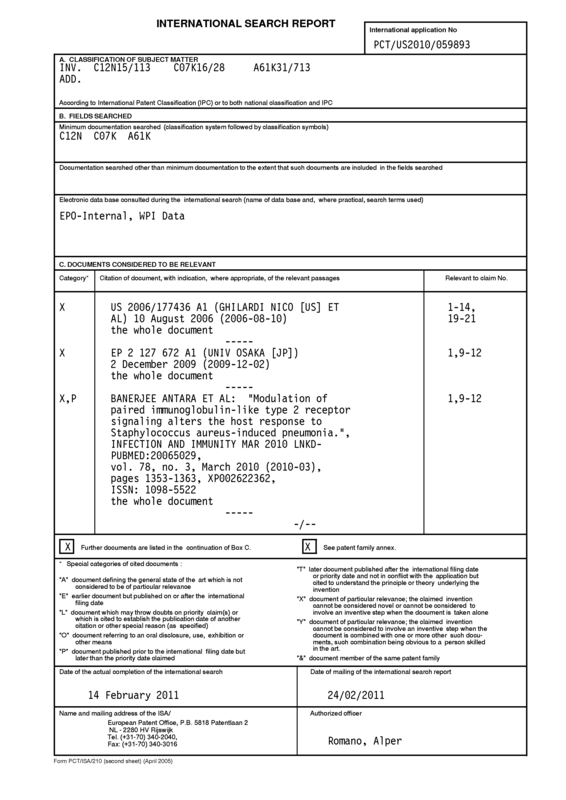 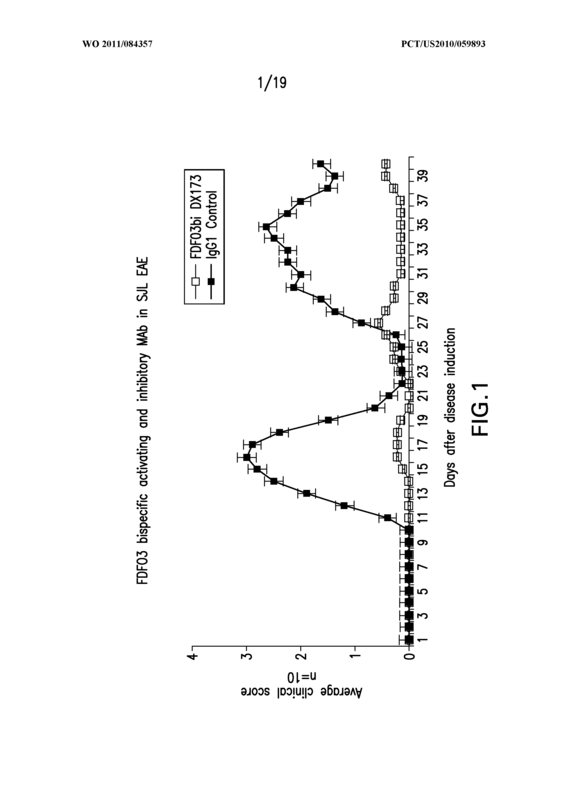 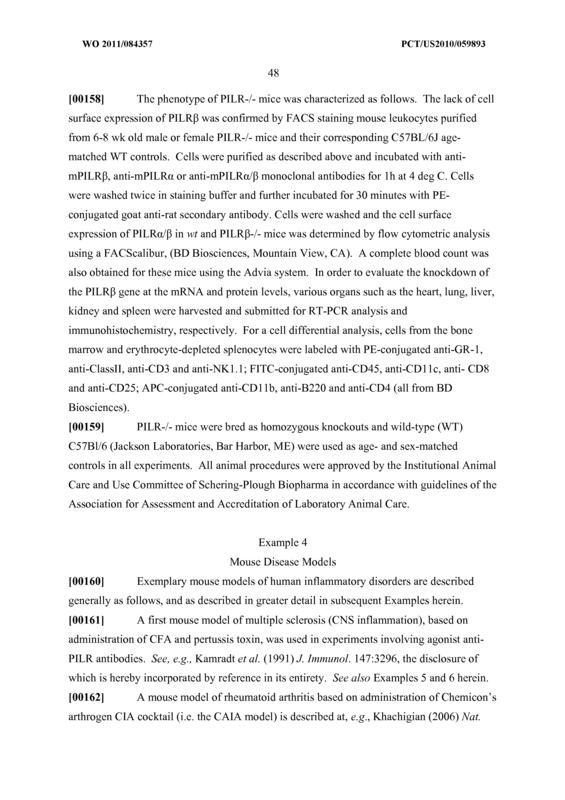 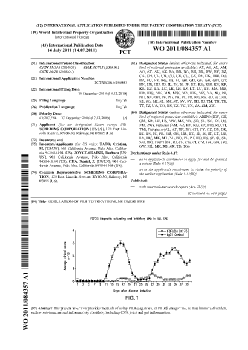 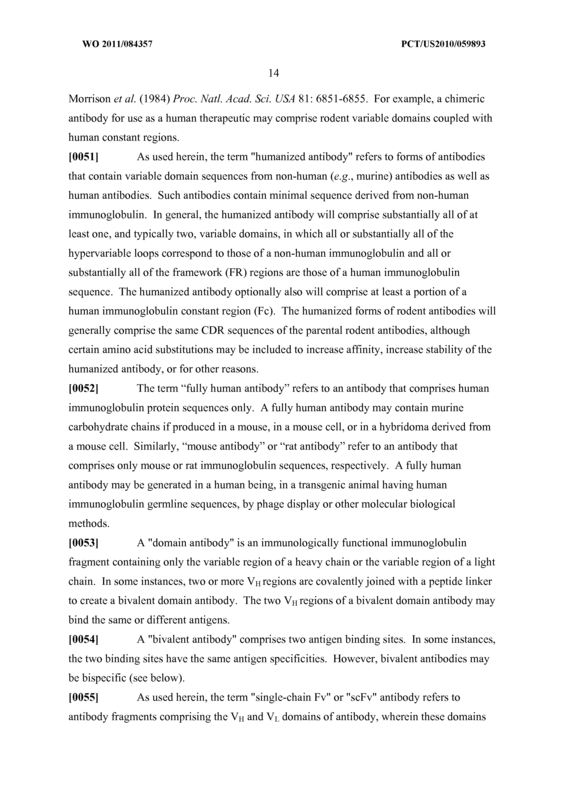 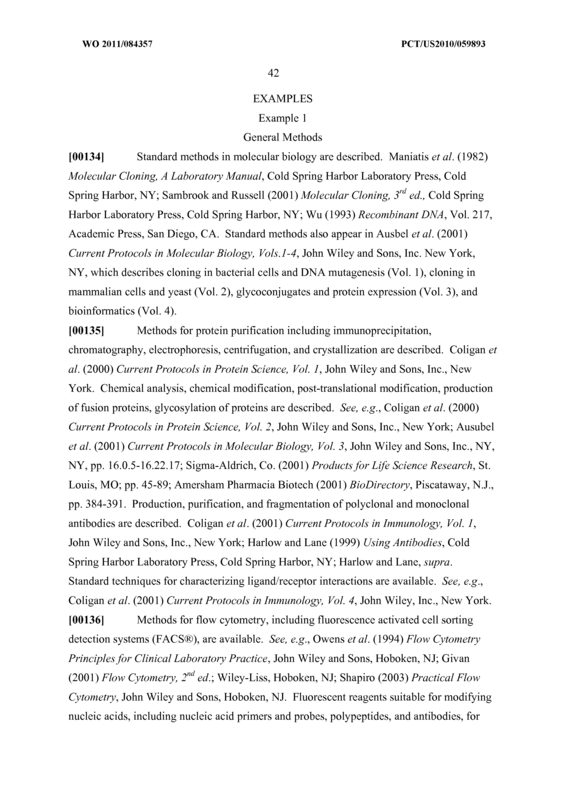 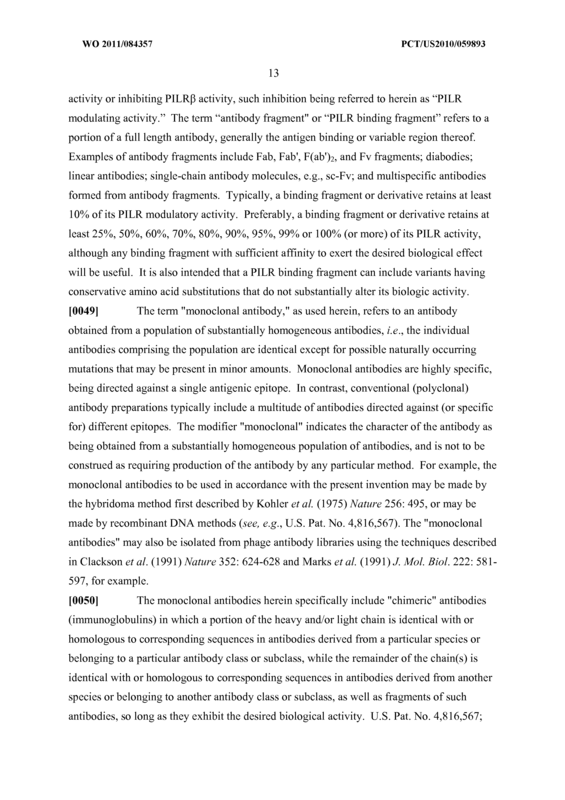 The method of Claim 19, comprising administering a chimeric, humanized or fully human antagonist antibody that specifically binds to PILR , or antigen-binding fragment thereof. 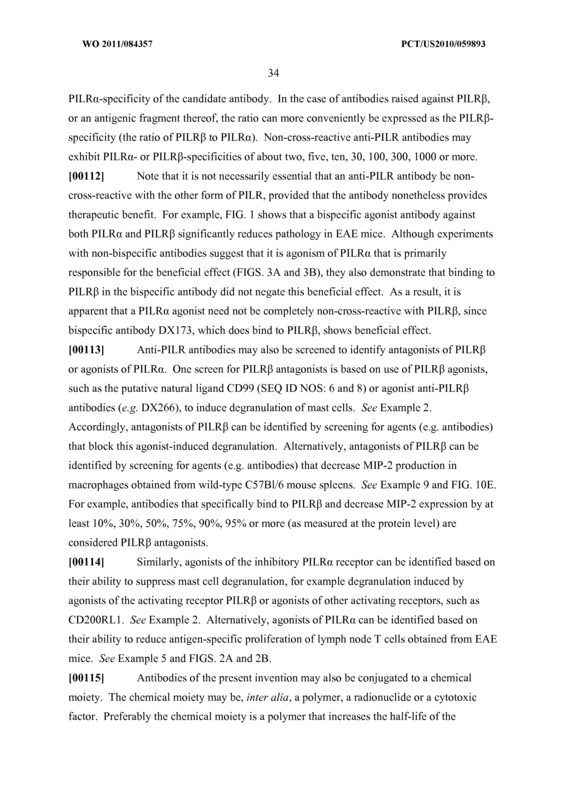 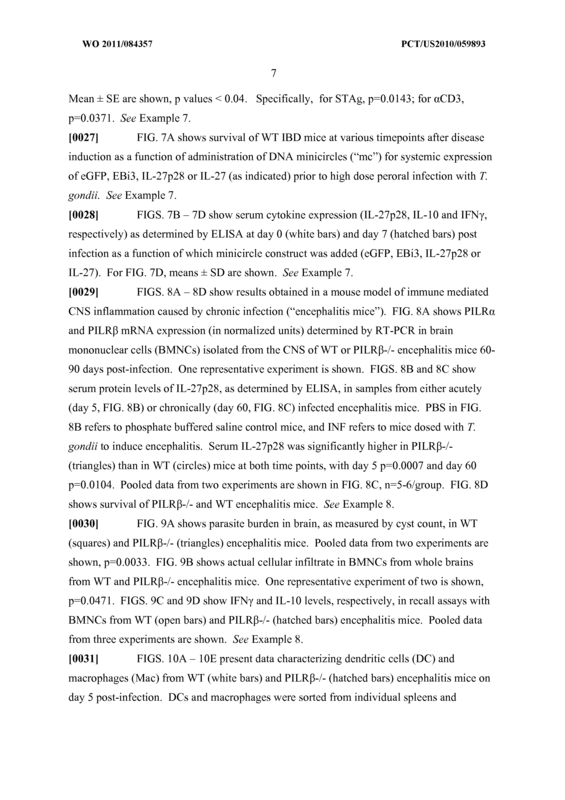 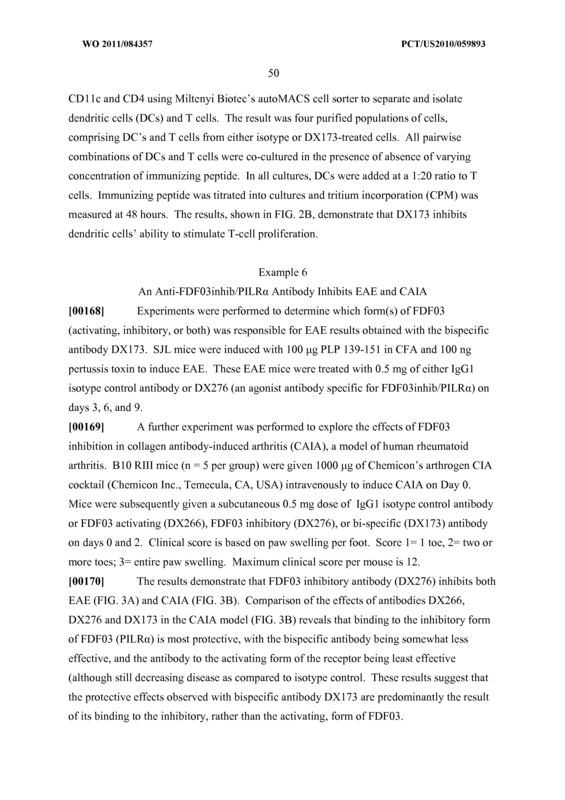 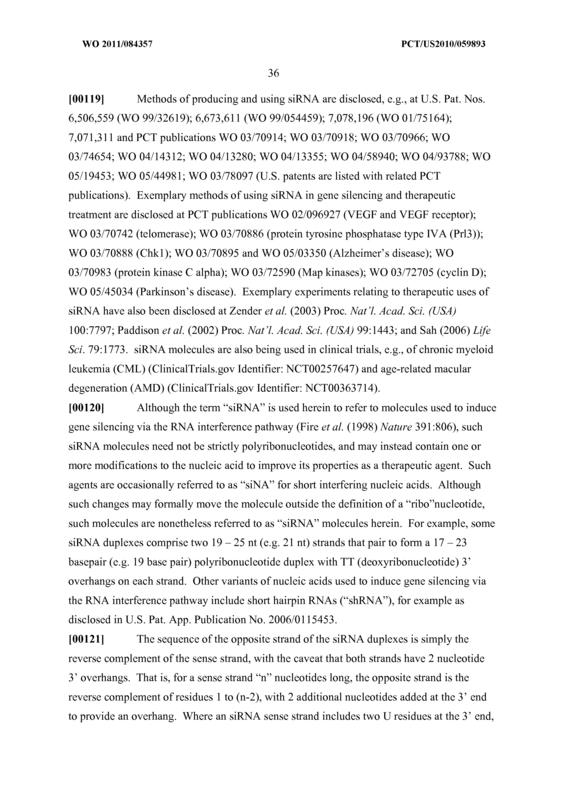 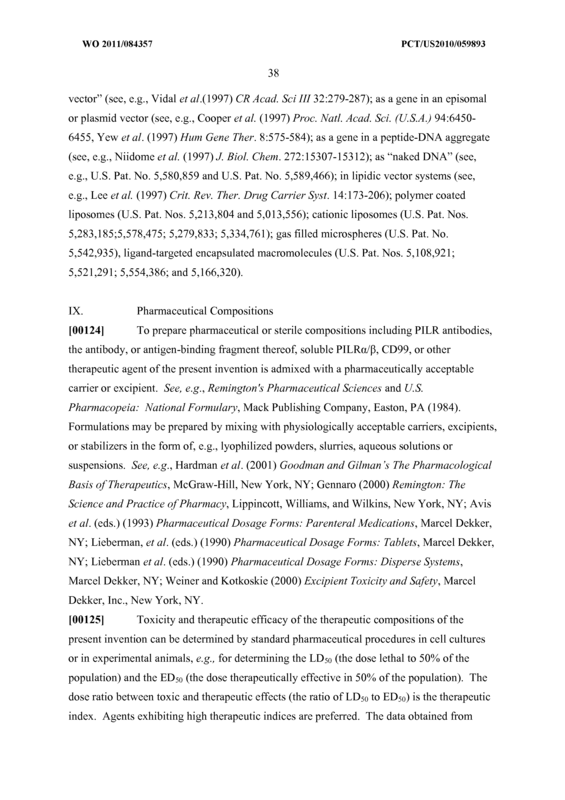 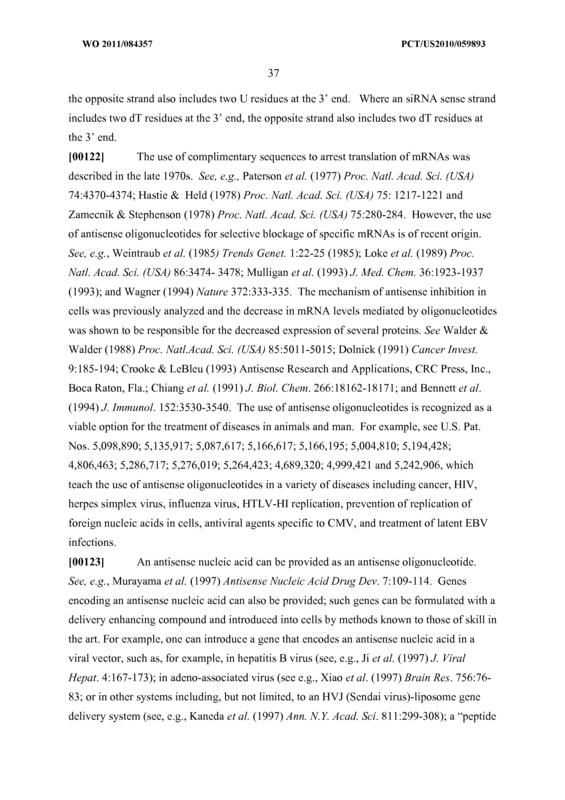 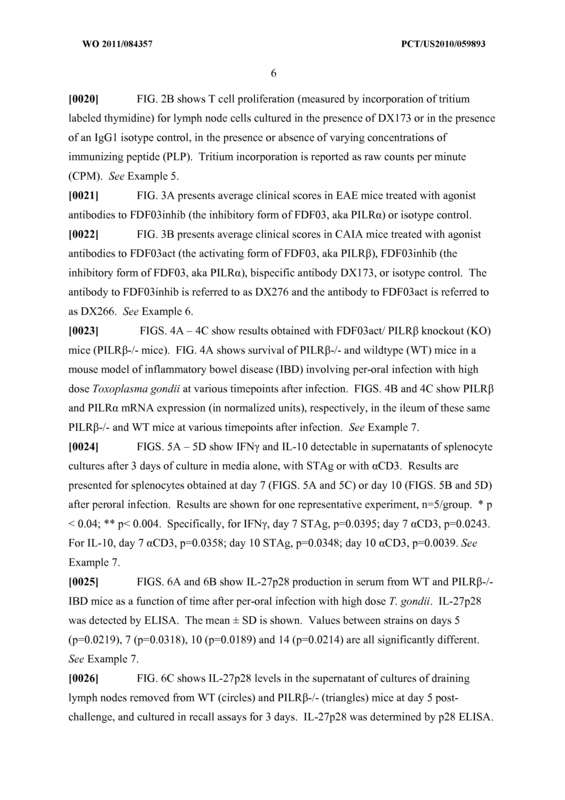 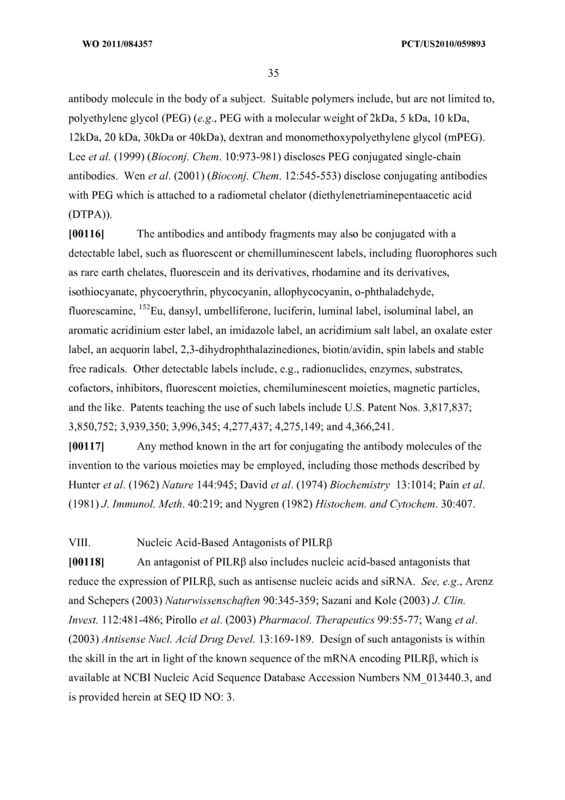 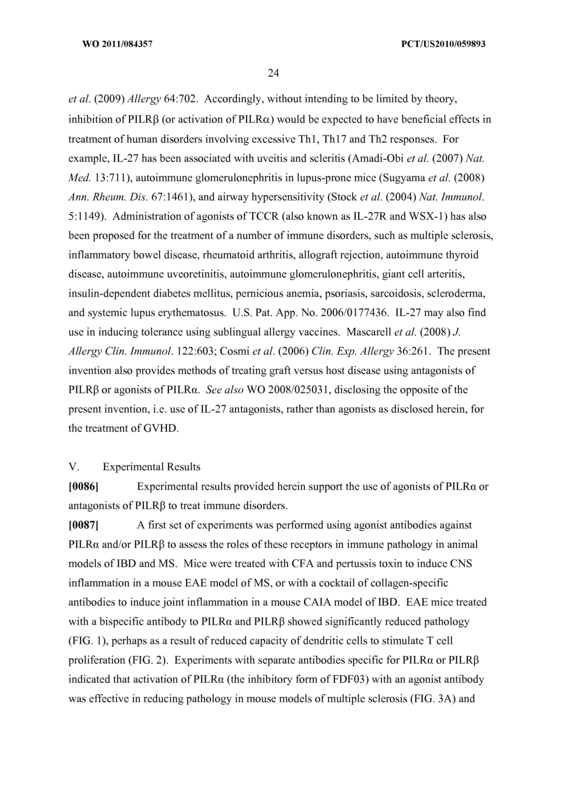 The method of Claim 19, comprising administering a chimeric, humanized or fully human agonist antibody that specifically binds to PILRa, or antigen-binding fragment thereof.